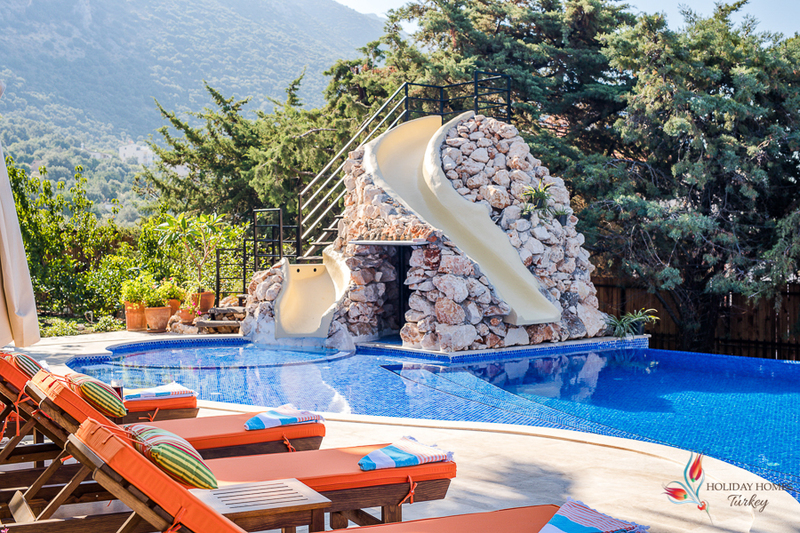 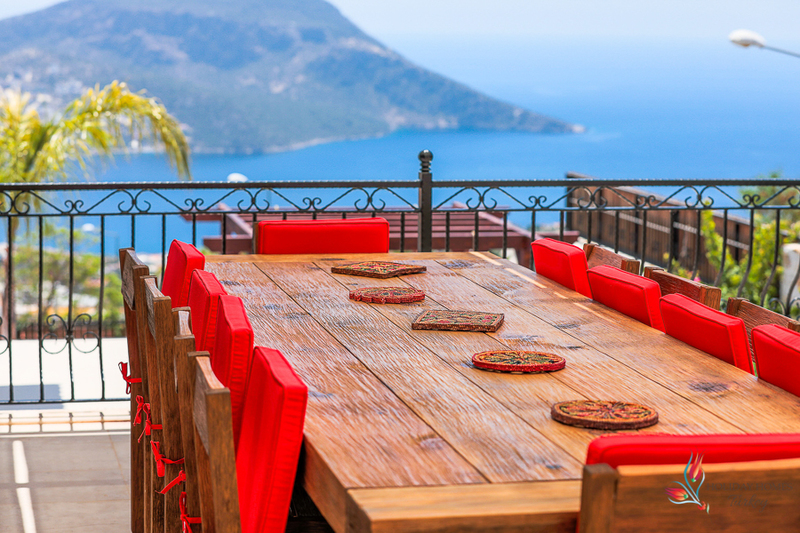 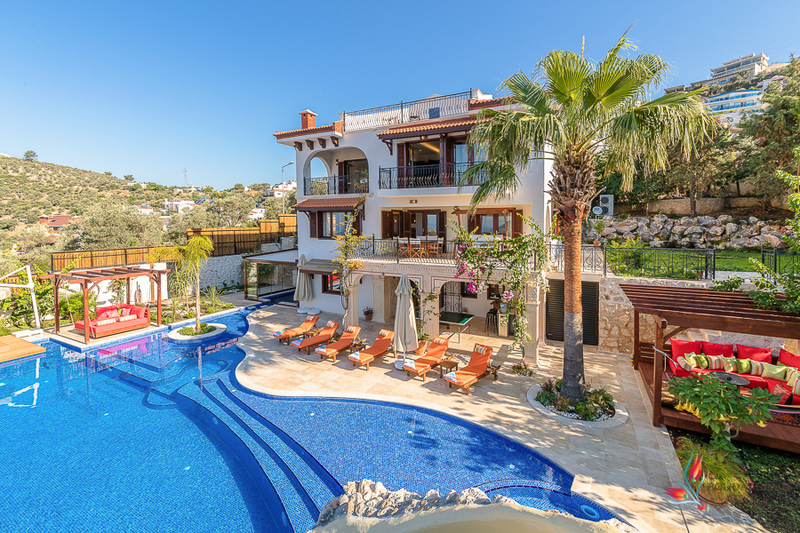 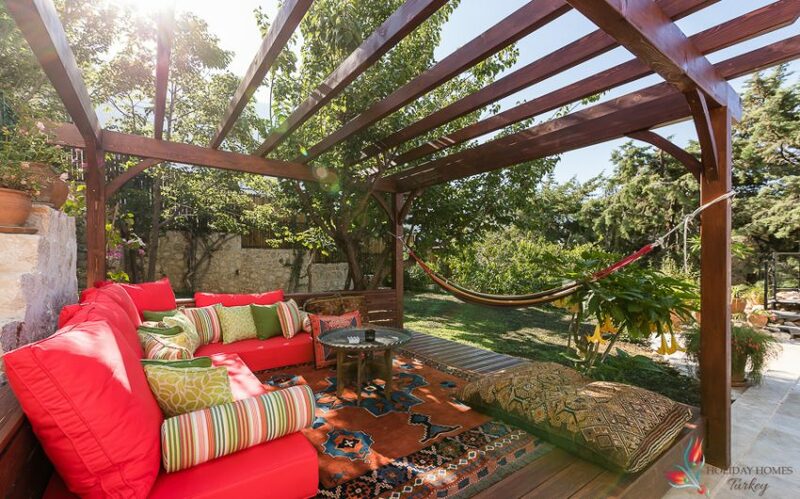 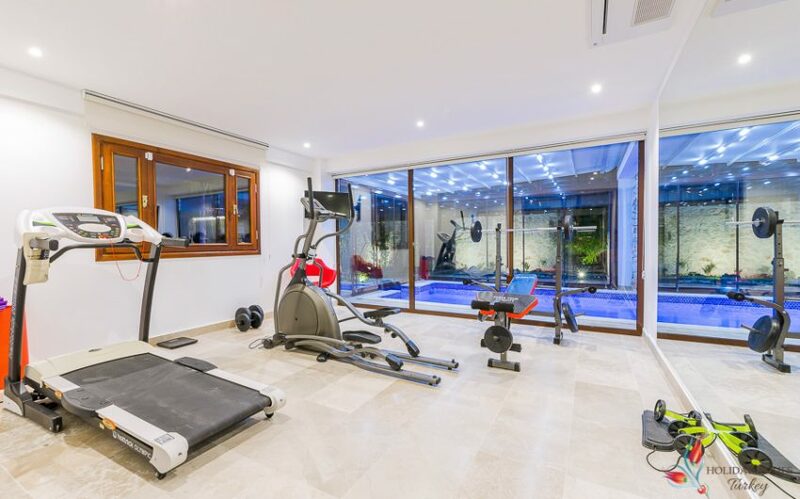 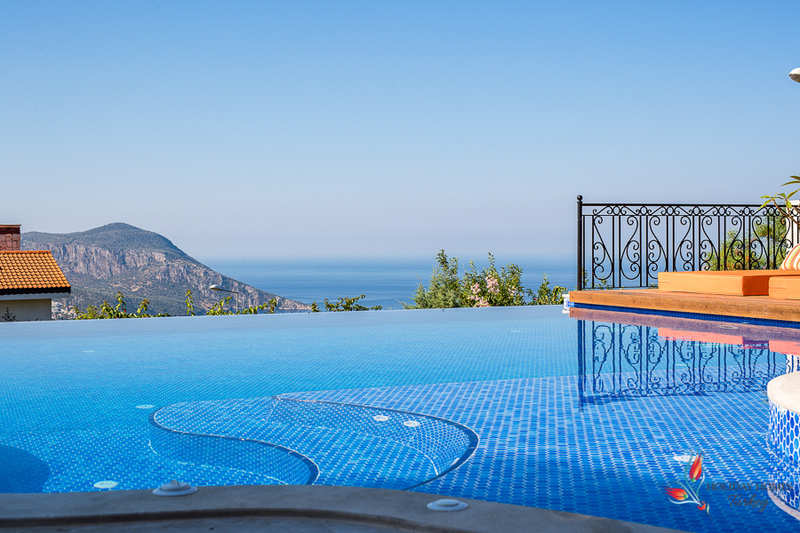 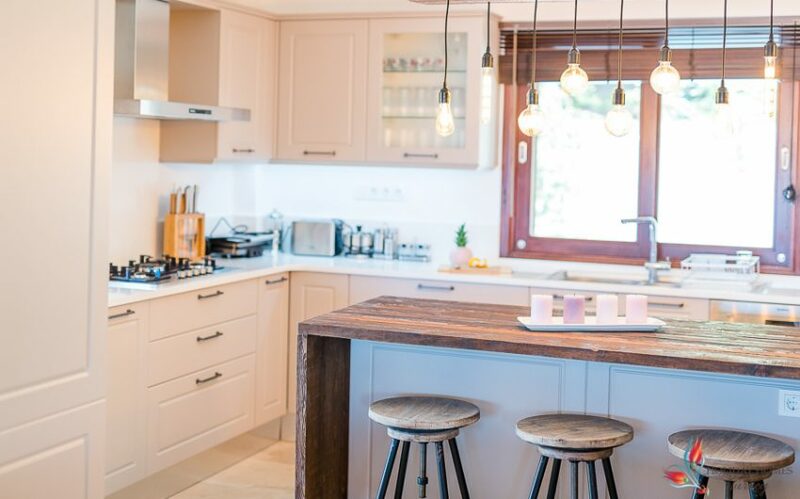 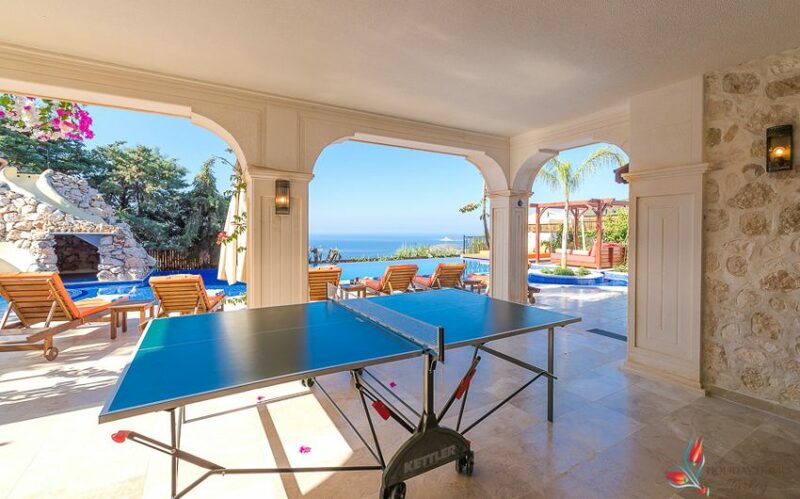 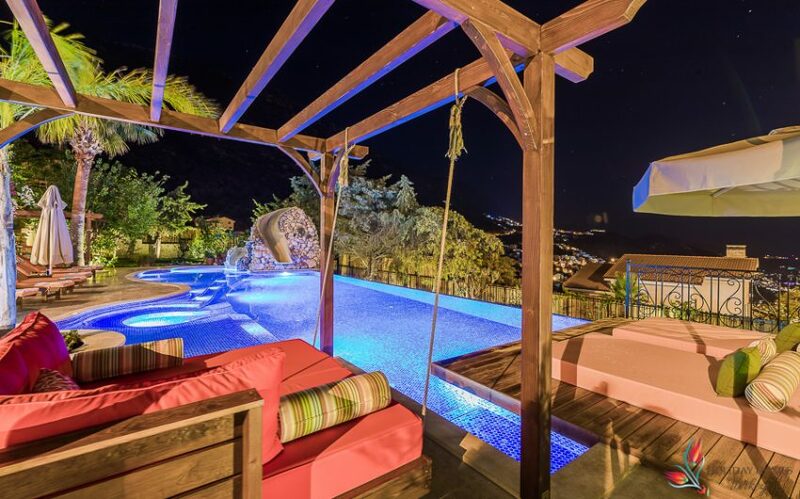 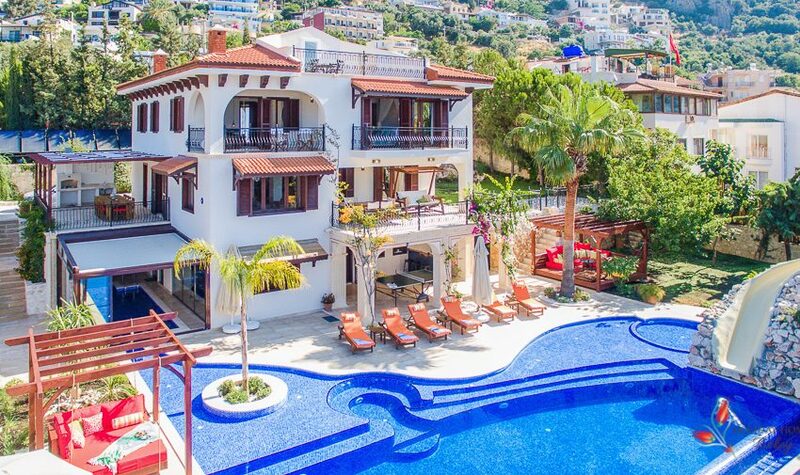 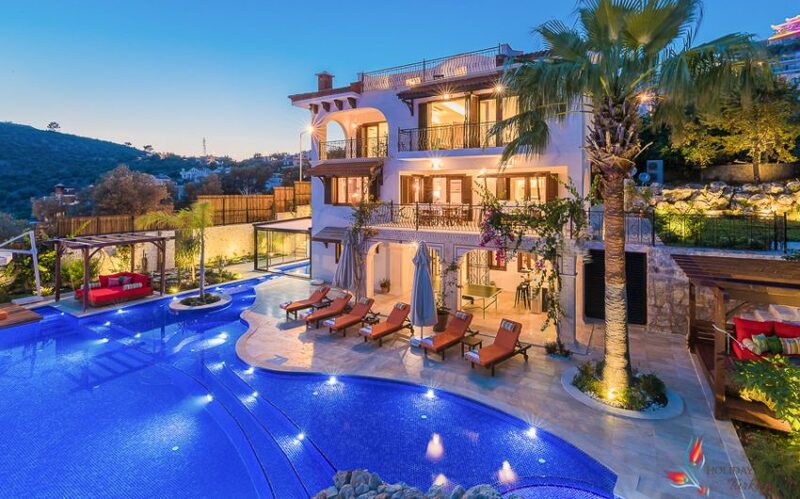 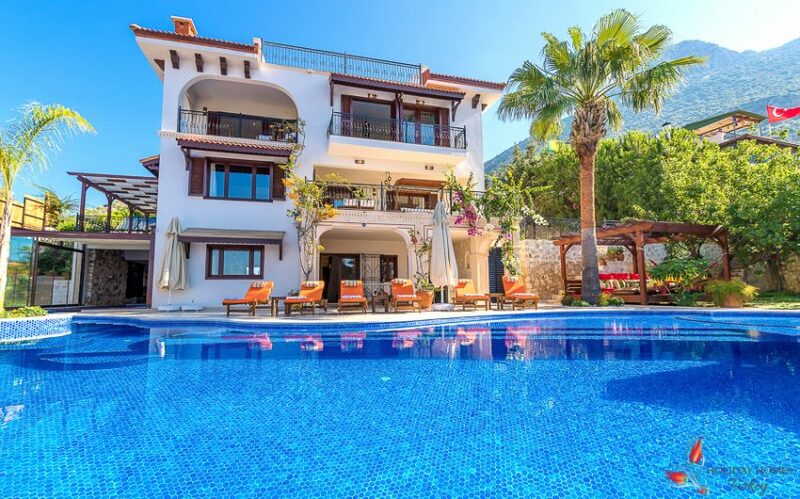 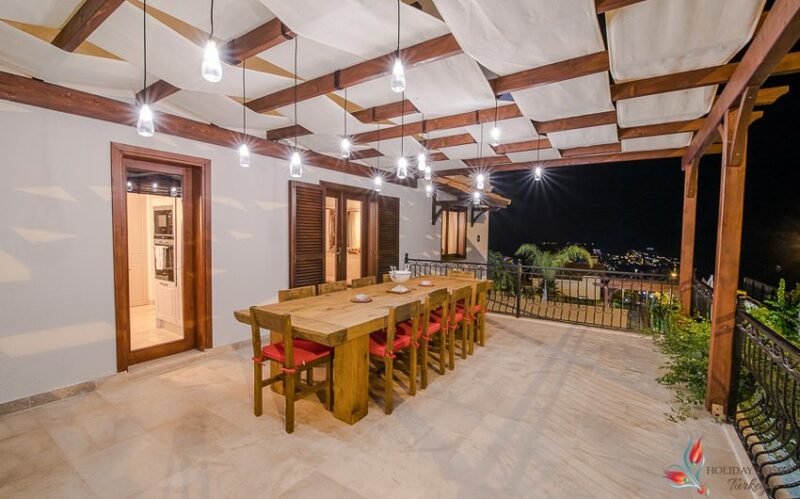 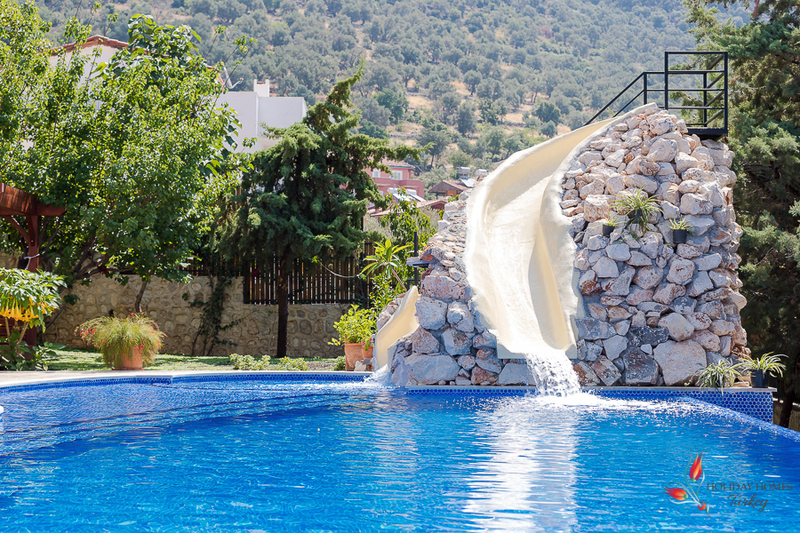 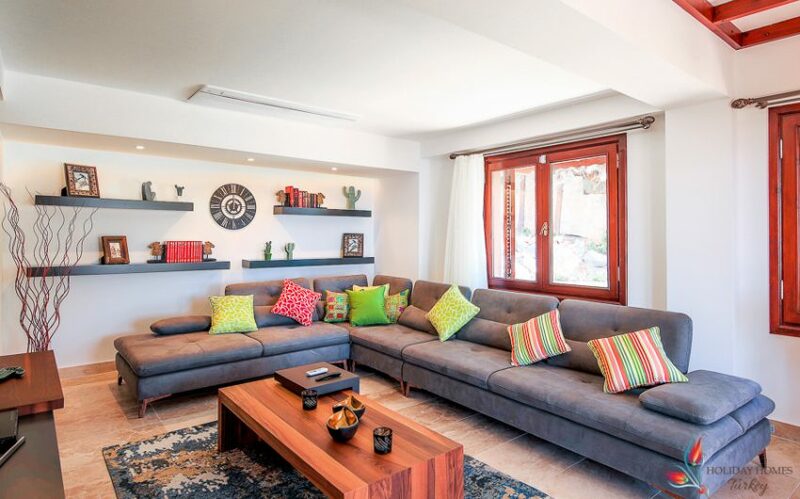 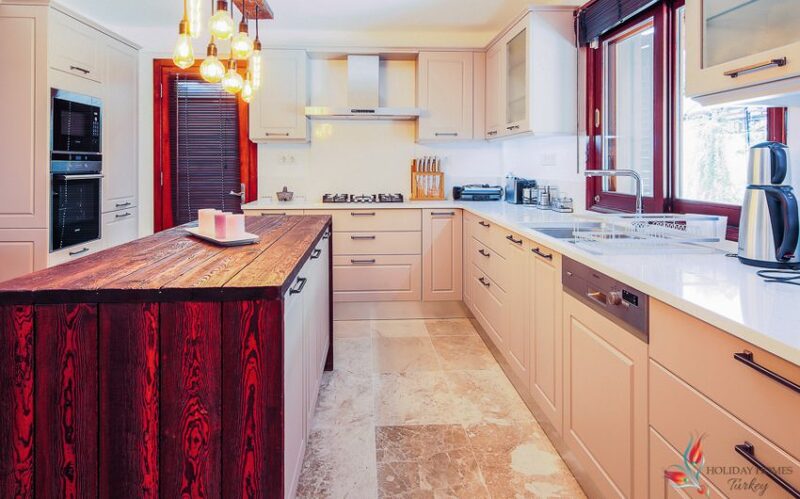 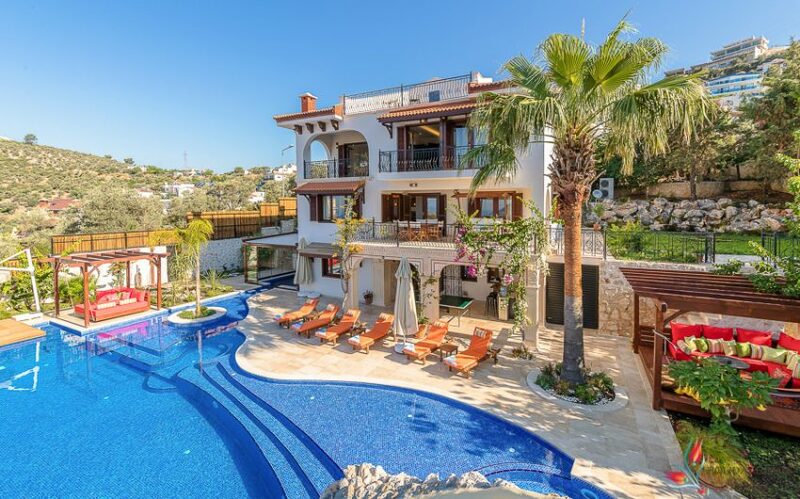 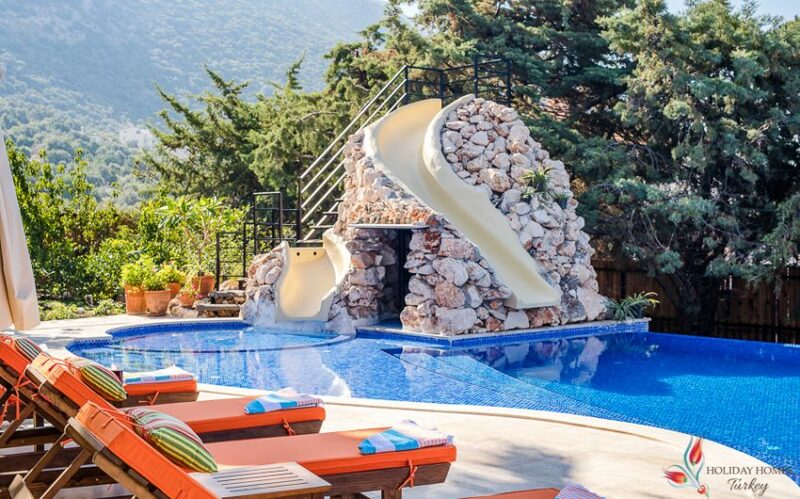 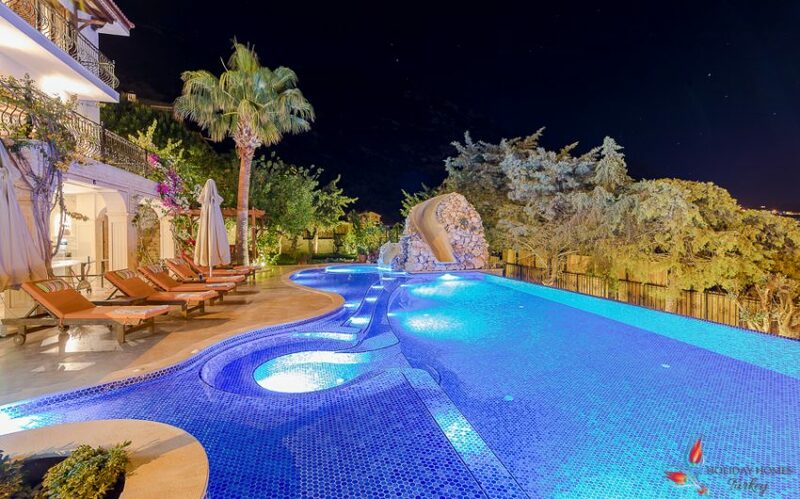 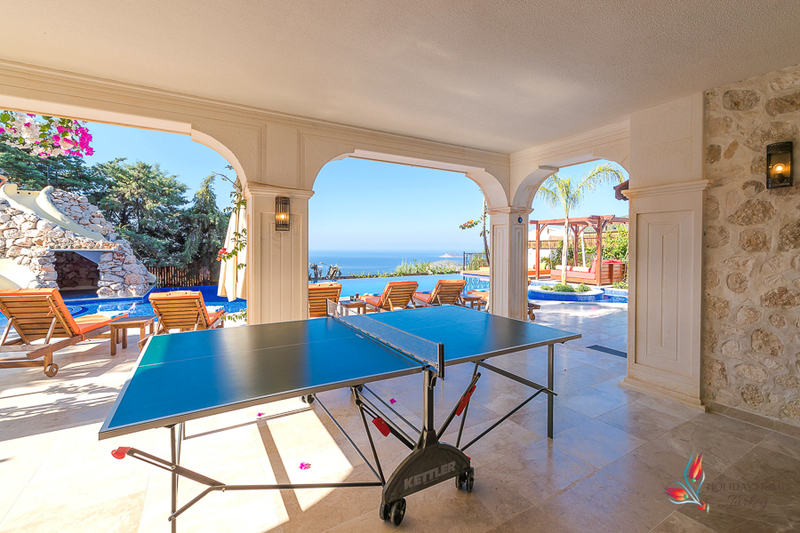 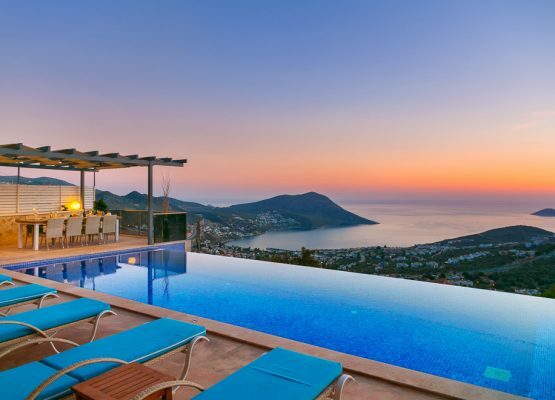 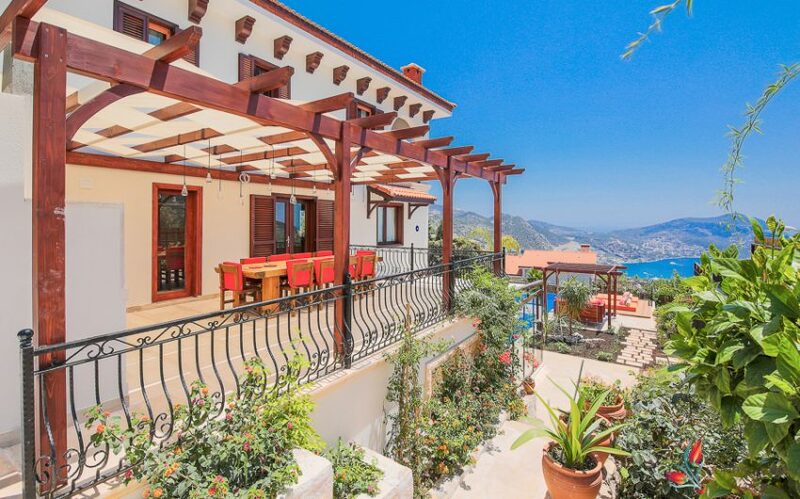 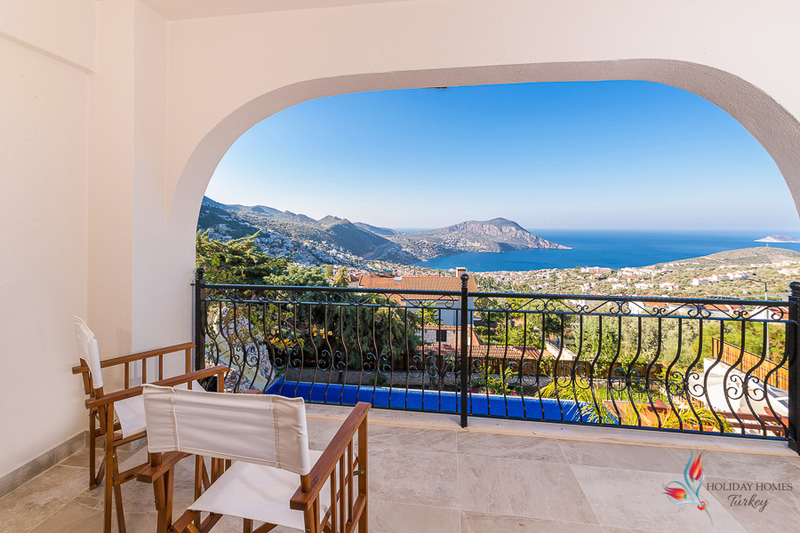 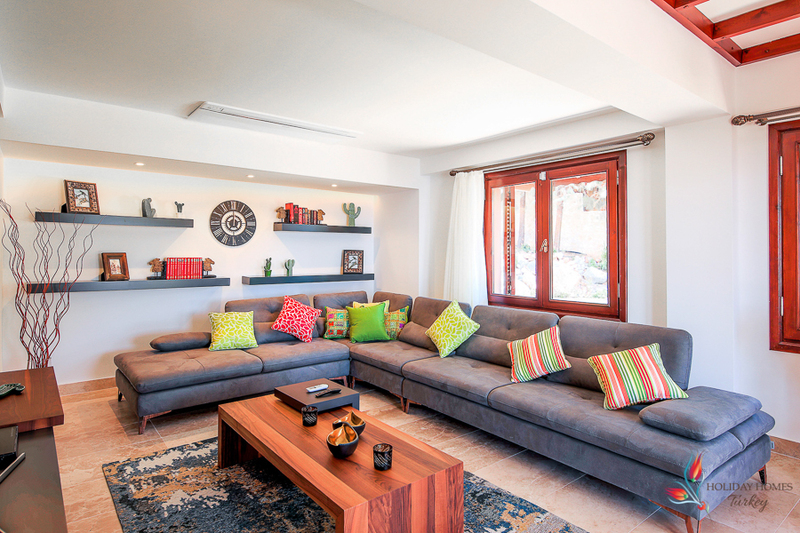 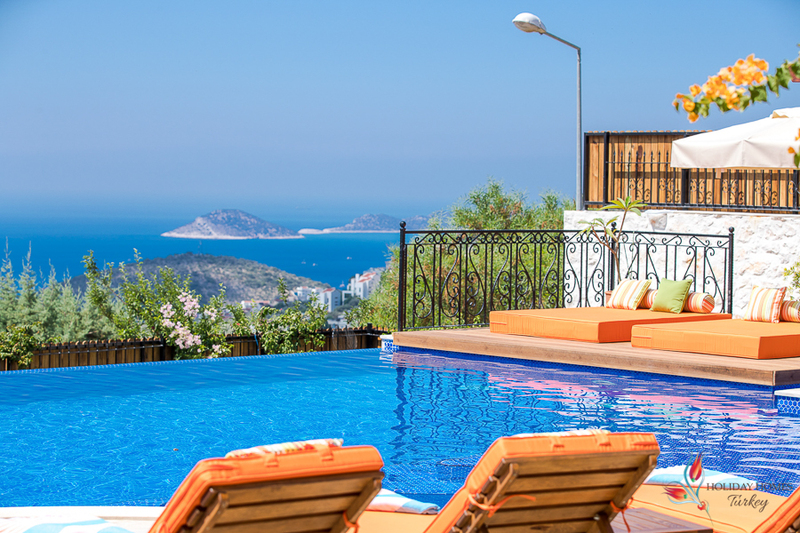 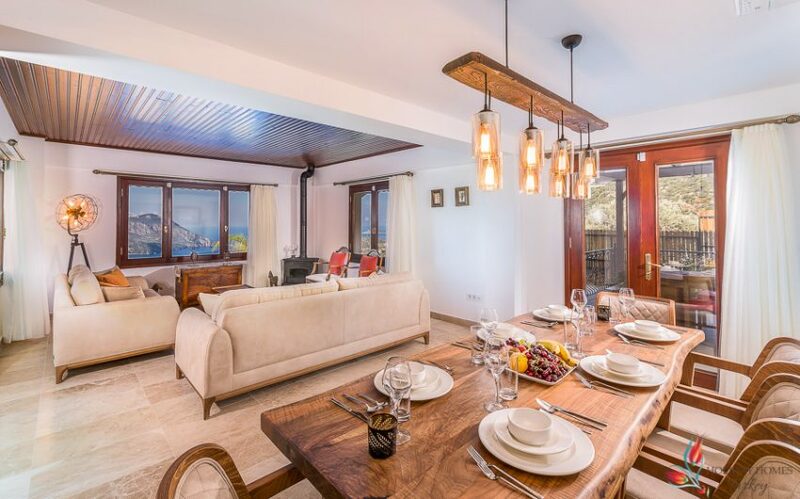 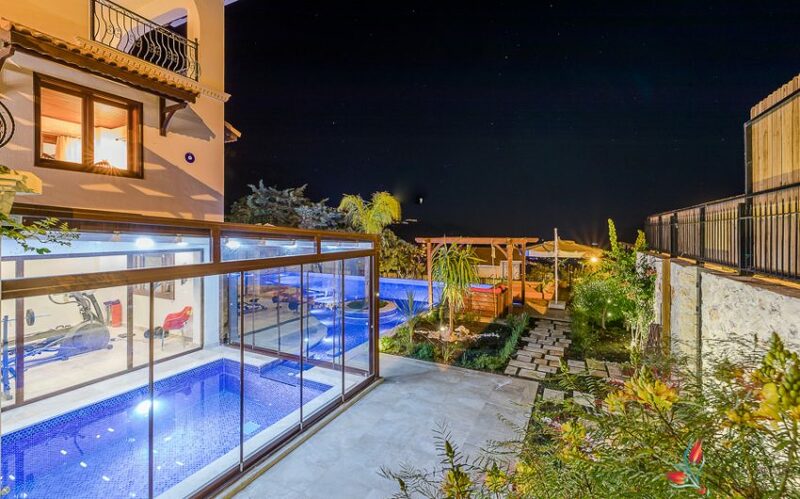 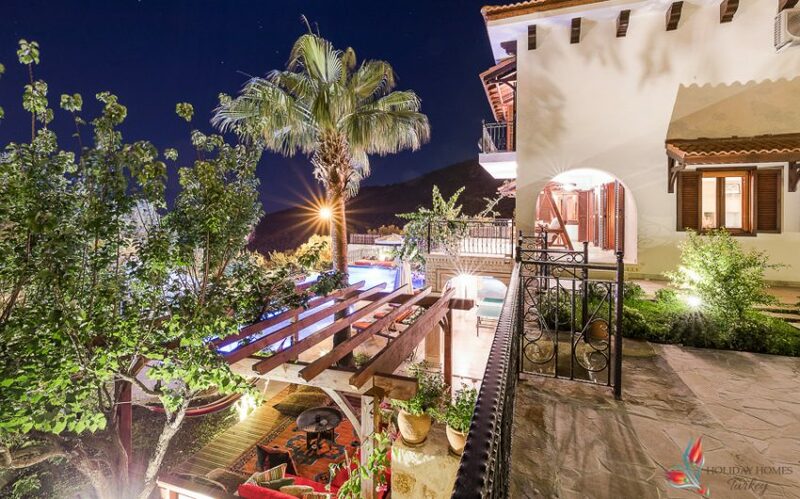 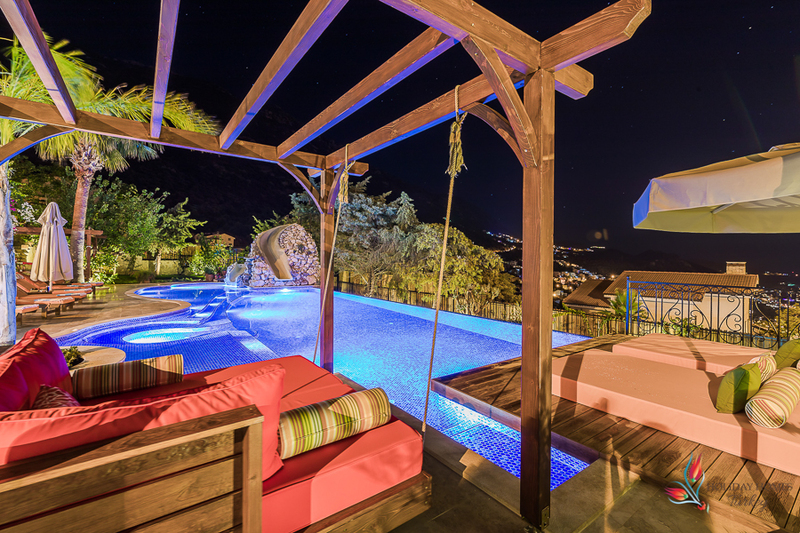 One of the newest and most striking properties in Kalkan, Premier Villa has been designed to be a luxurious get-away for grown ups, while providing plenty of space and entertainment for the whole family, from youngest to oldest. 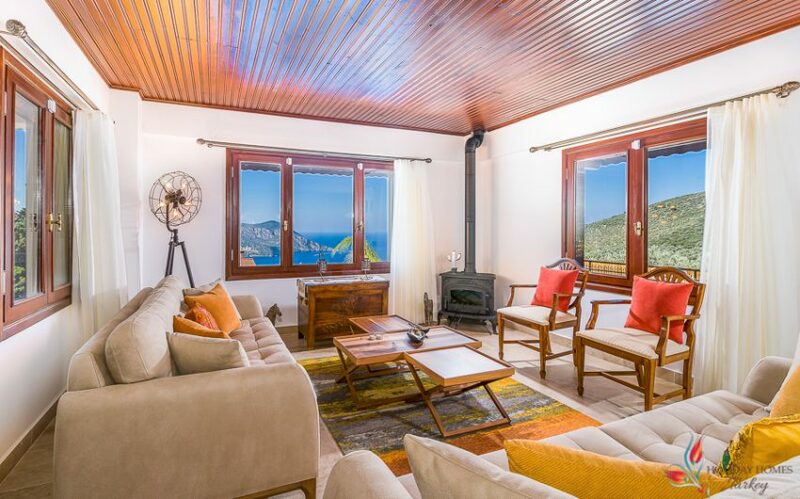 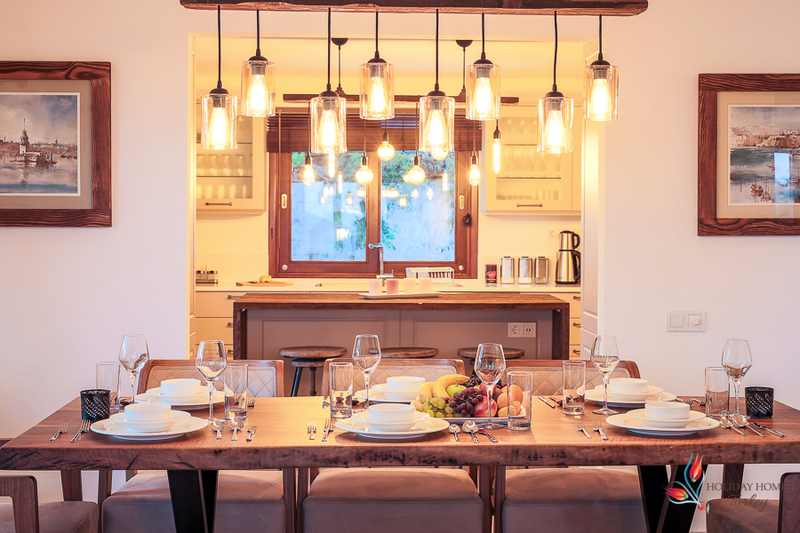 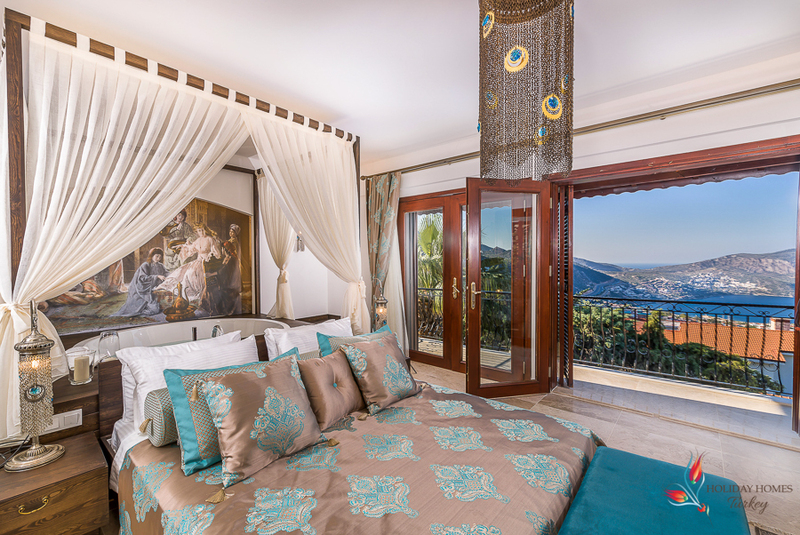 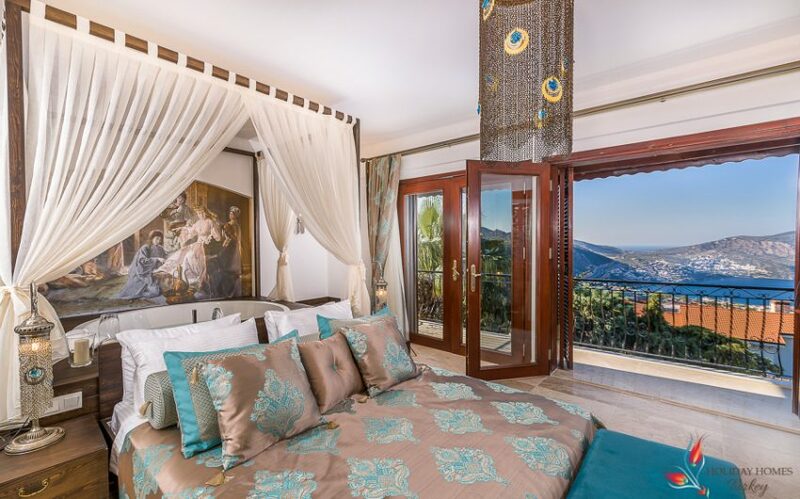 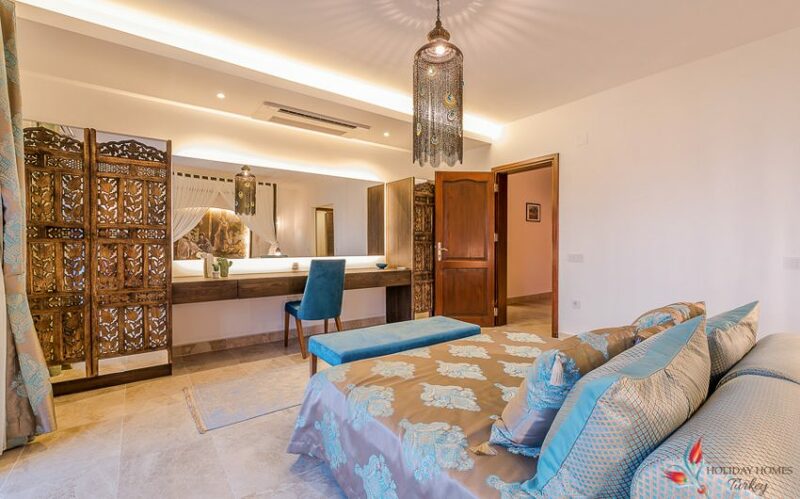 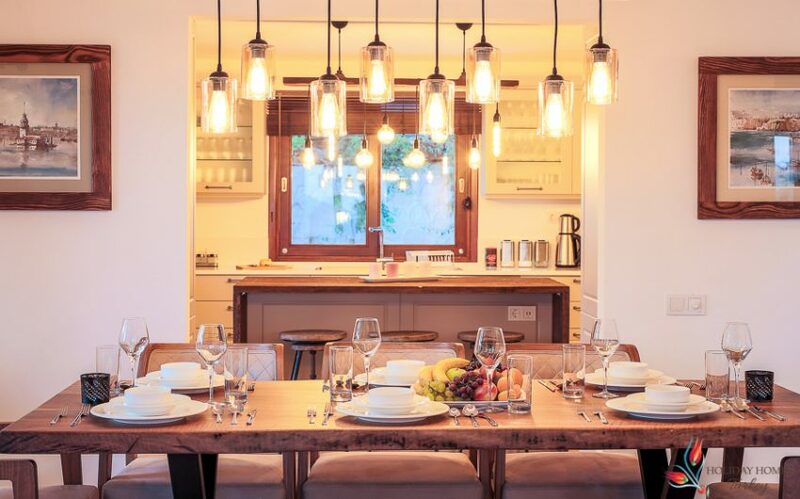 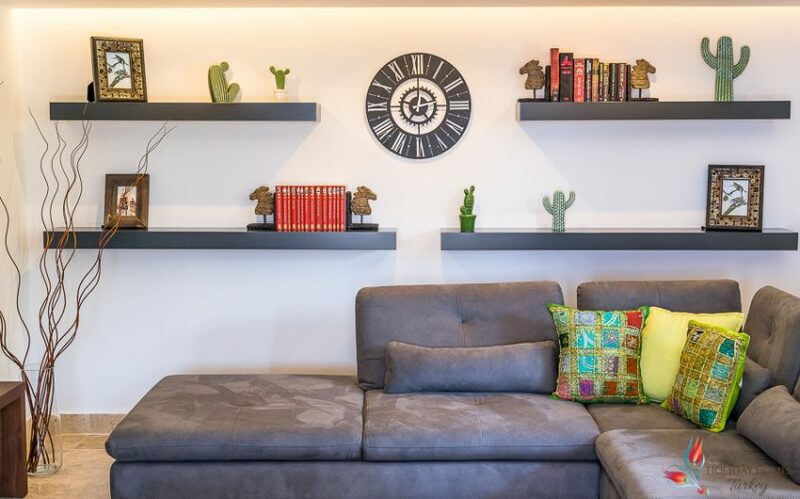 Stunningly stylish interiors with Moroccan influenced features, much use of reclaimed wood, bespoke lighting and hand painted tiles throughout, with envious 360 views encapsulating the picturesque mountainside around to the charming bay make Premier Villa in Kalkan a joy to be in and around. 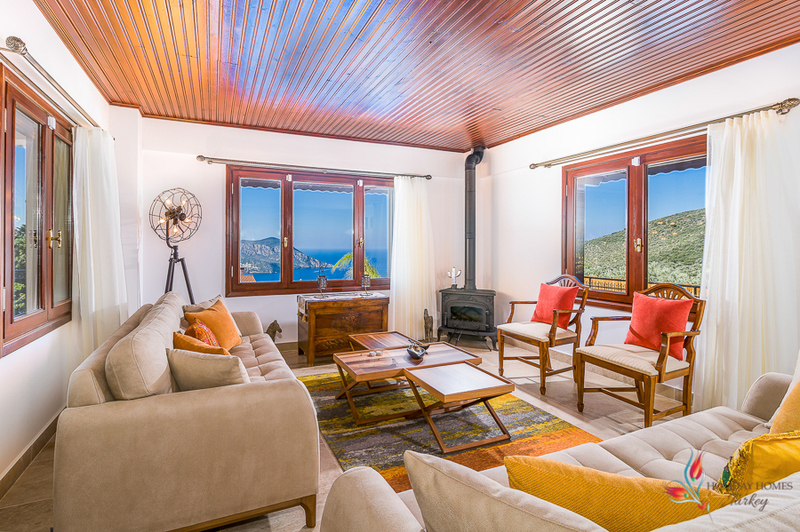 Underfloor heating for winter months, plush sofas to both areas, imposing wood burning soba and soft bespoke lighting, low coffee tables, large smart TV to one sitting room, double doors to south facing balcony with super wooden swing seat to relax and admire the views from. 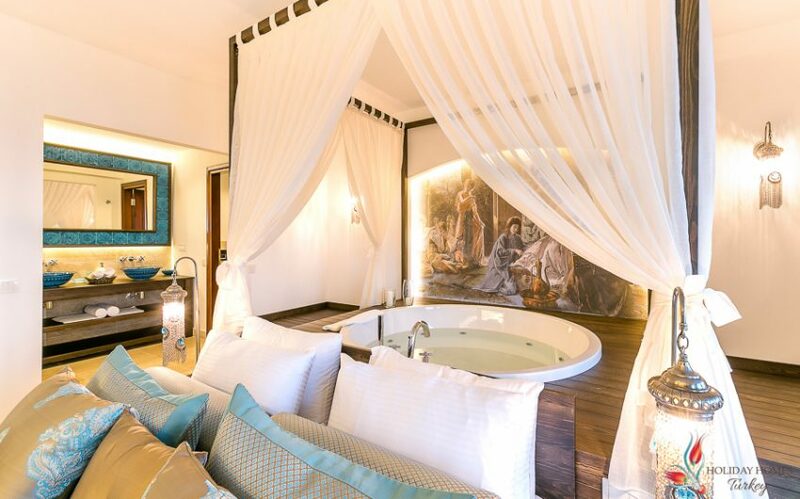 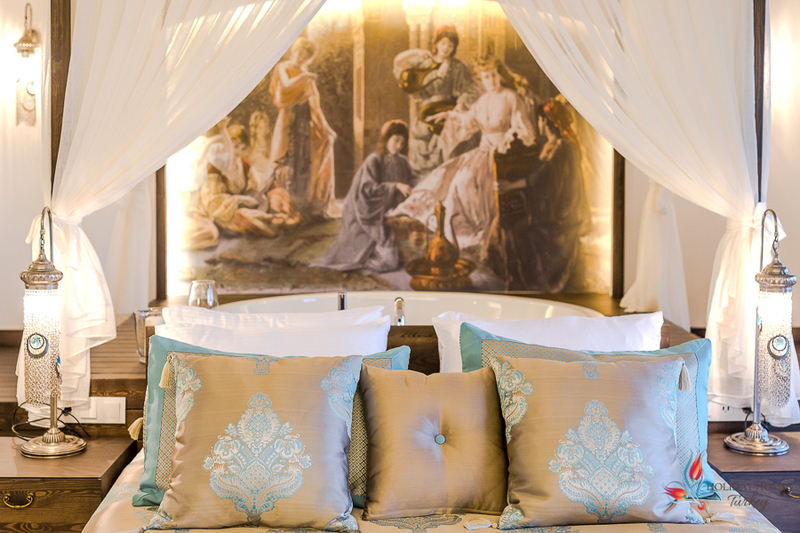 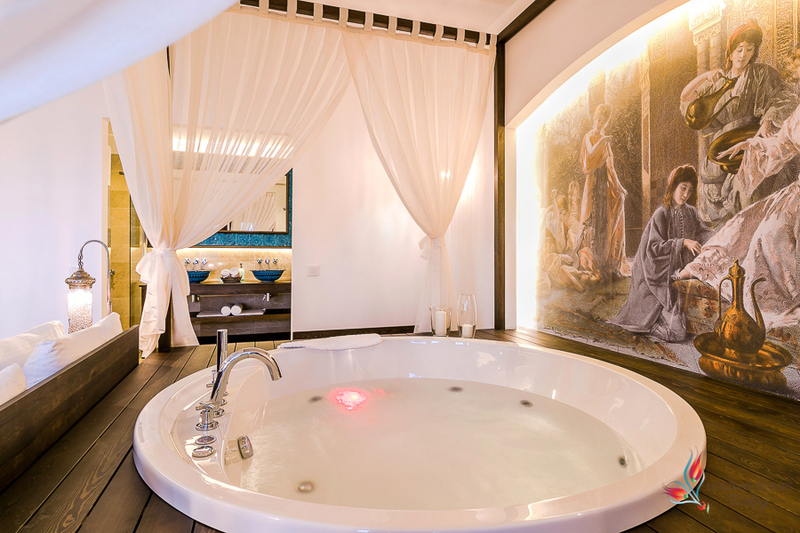 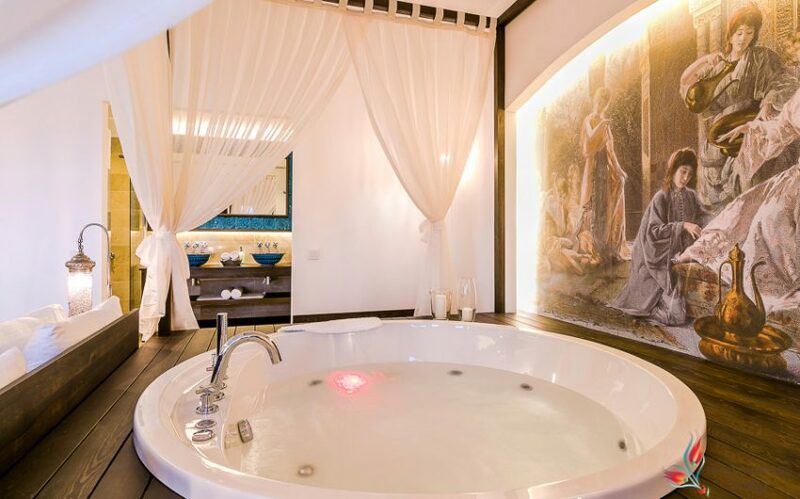 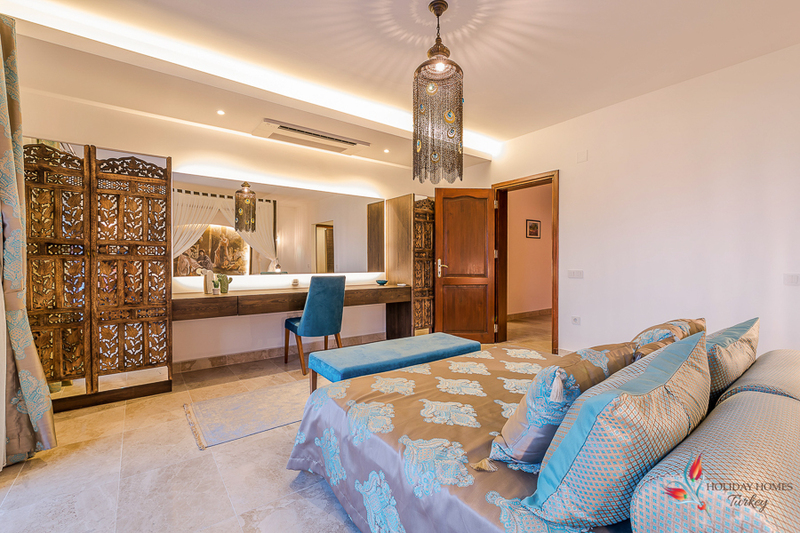 The suite is a sumptuous reflection of the Ottoman era, a Kingsize bed with hand carved cabinet work in reclaimed wood fronts a raised Jacuzzi bath with ambient lighting around. 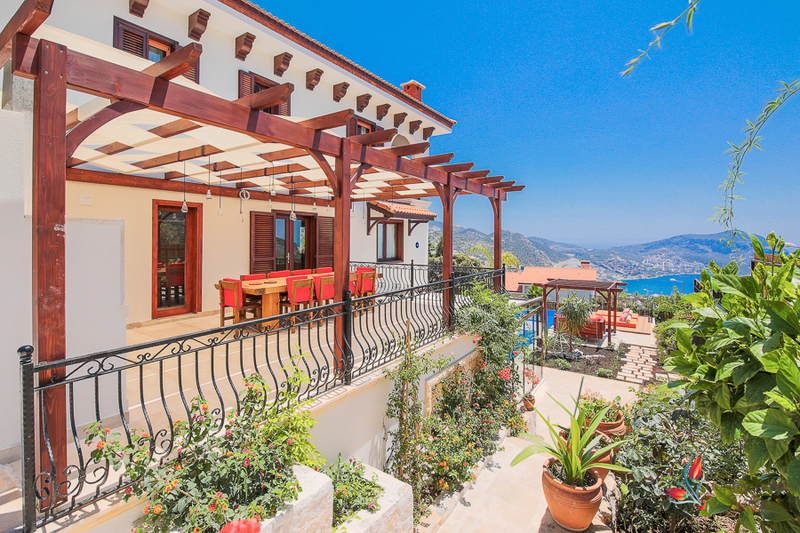 South facing balcony with breath-taking views. 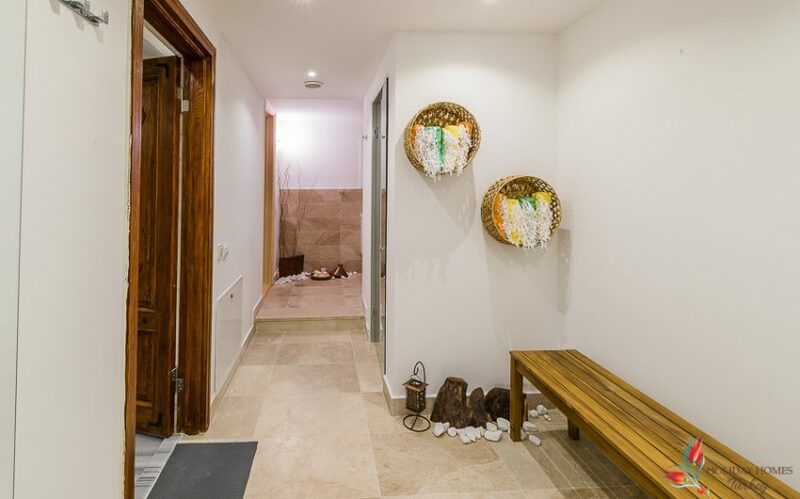 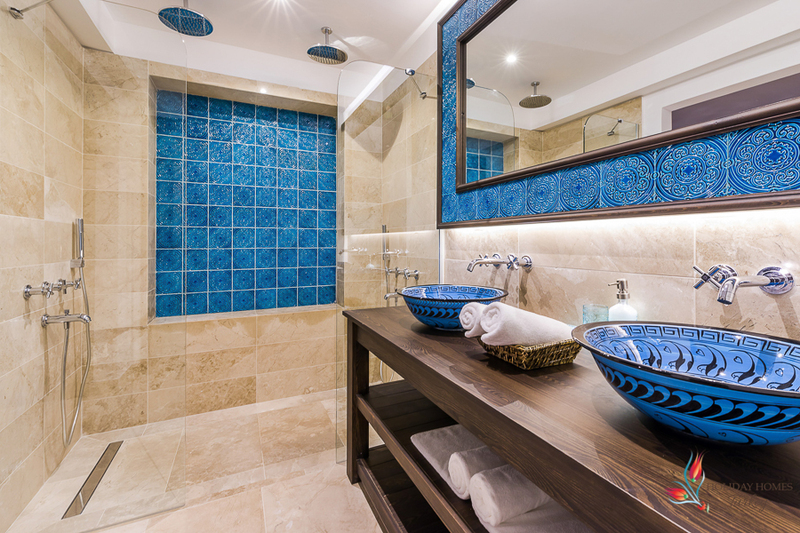 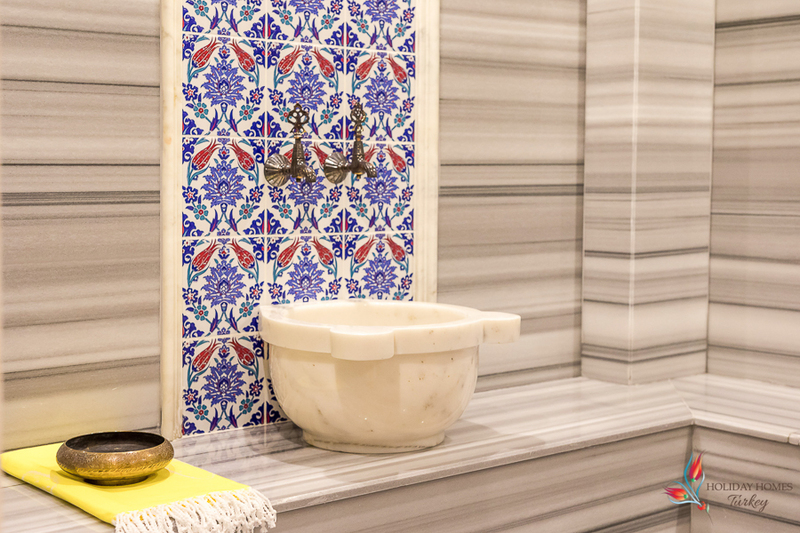 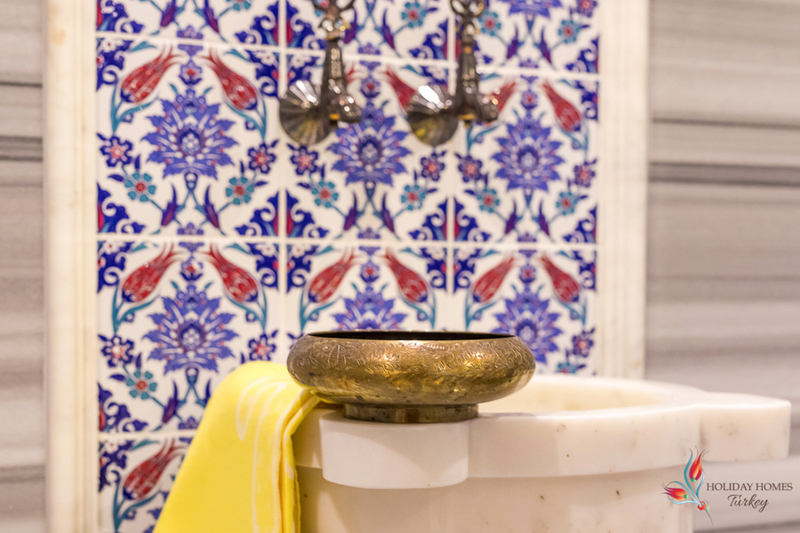 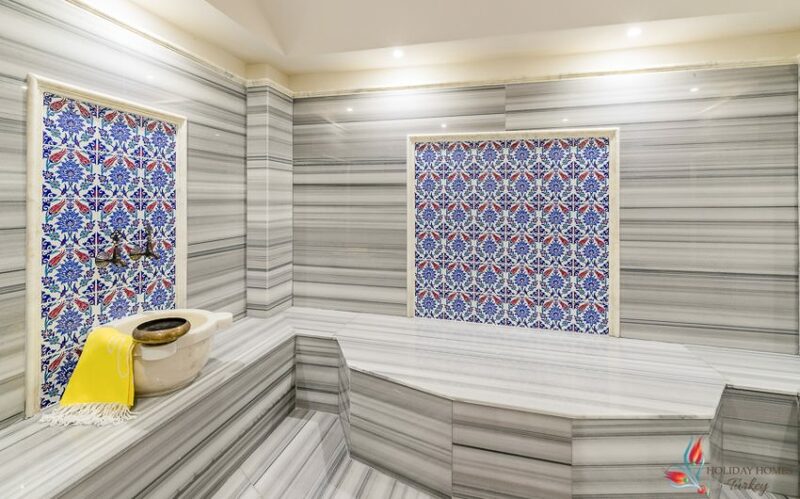 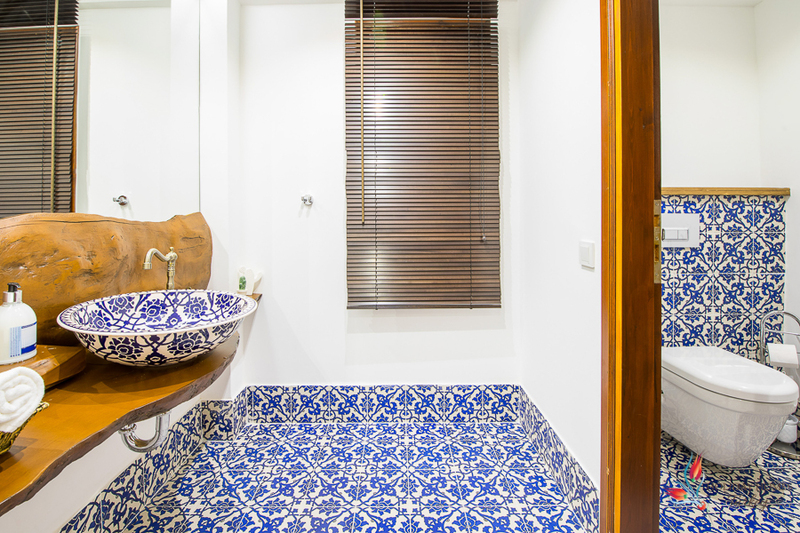 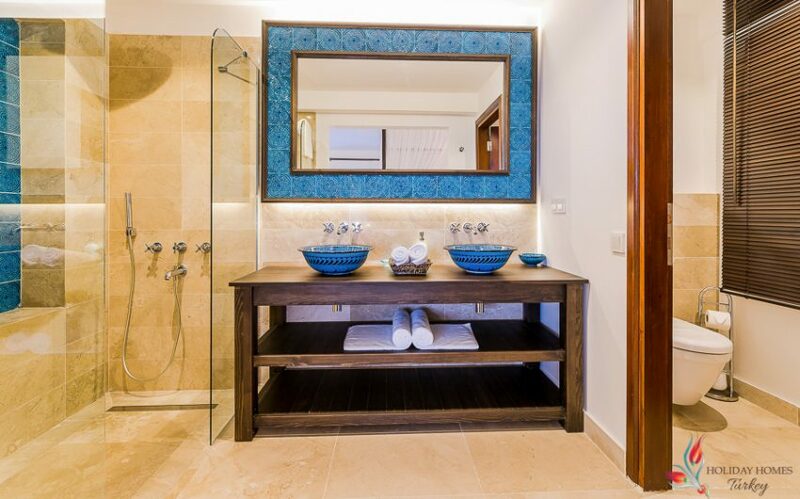 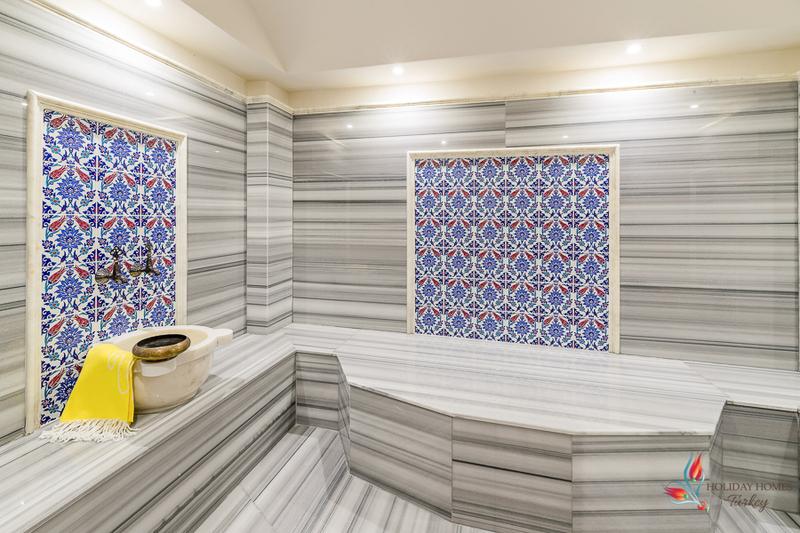 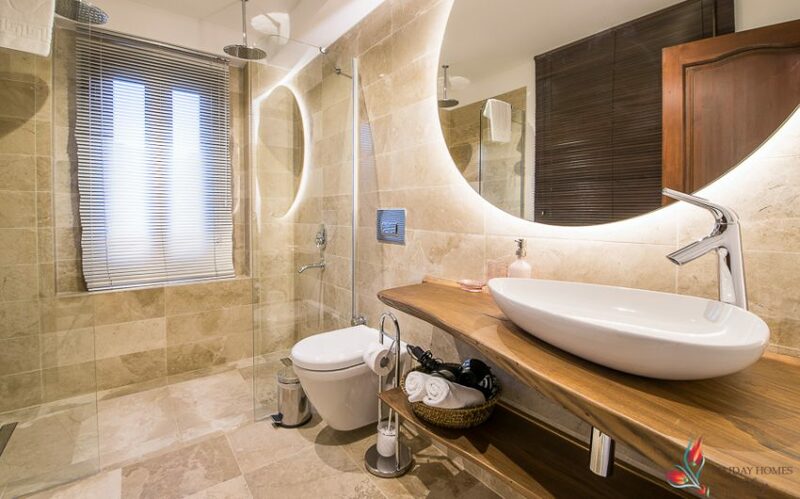 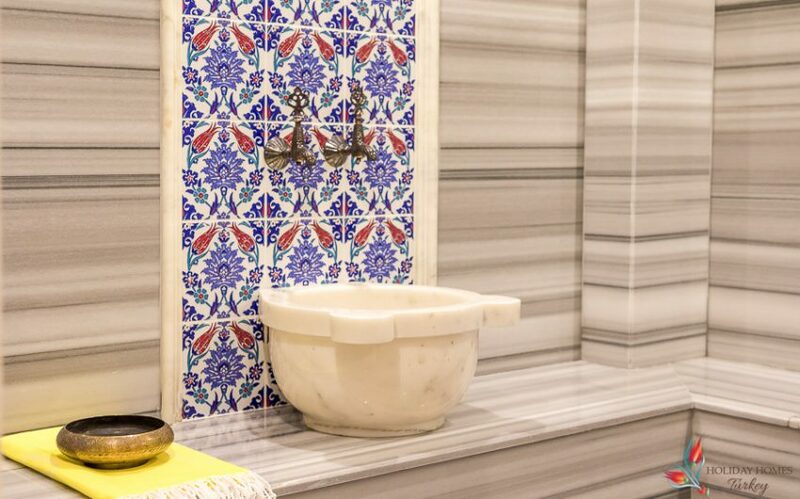 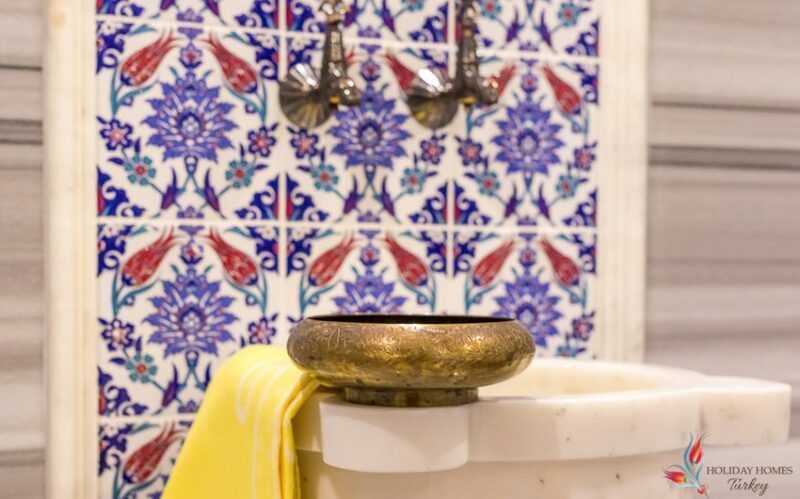 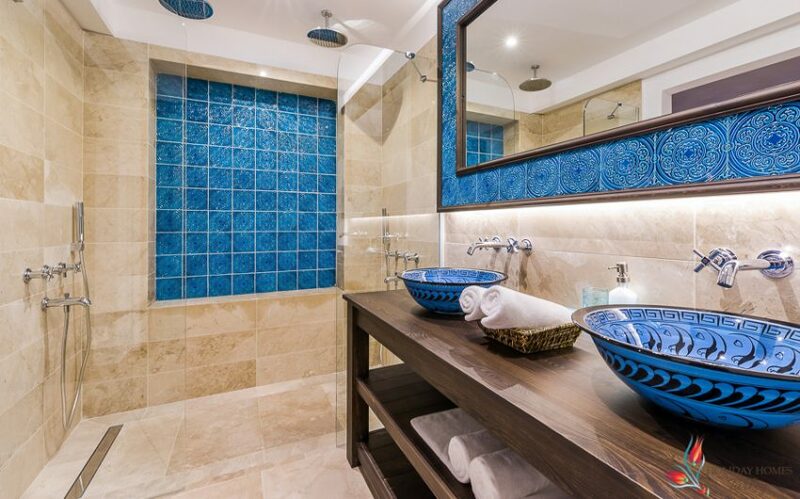 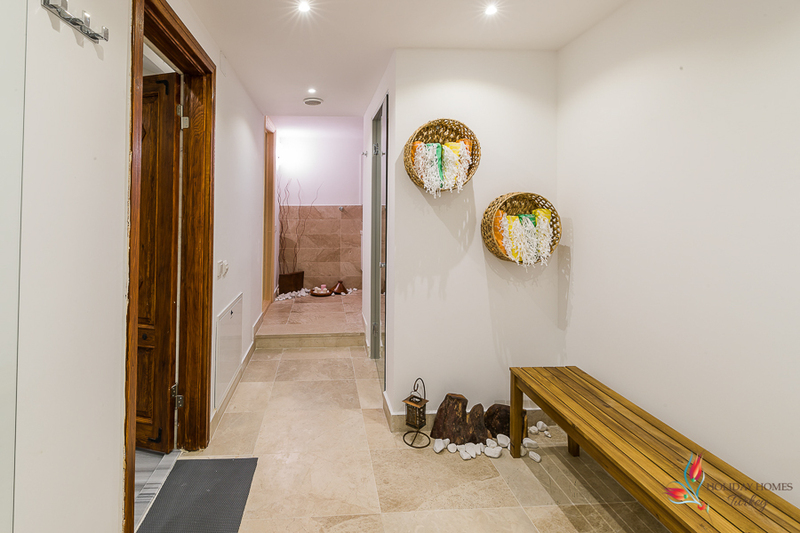 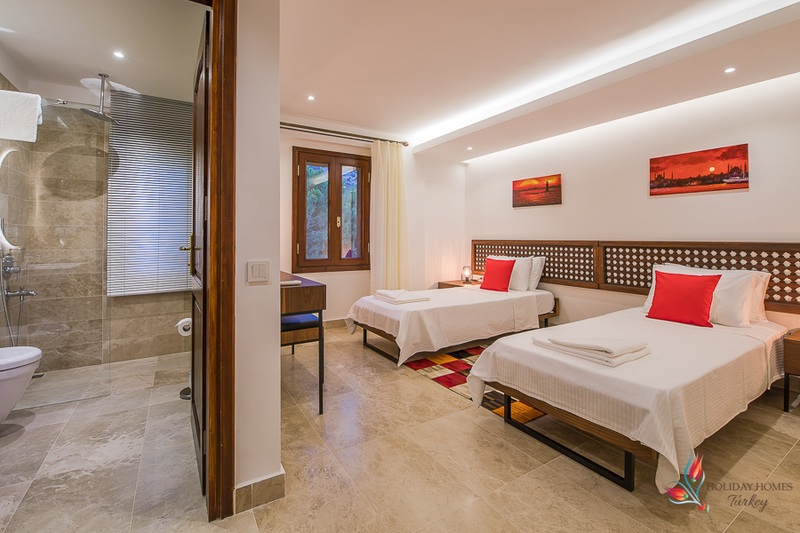 The en suite boasts his ’n’ hers showers, with sensational Moroccan style basins. 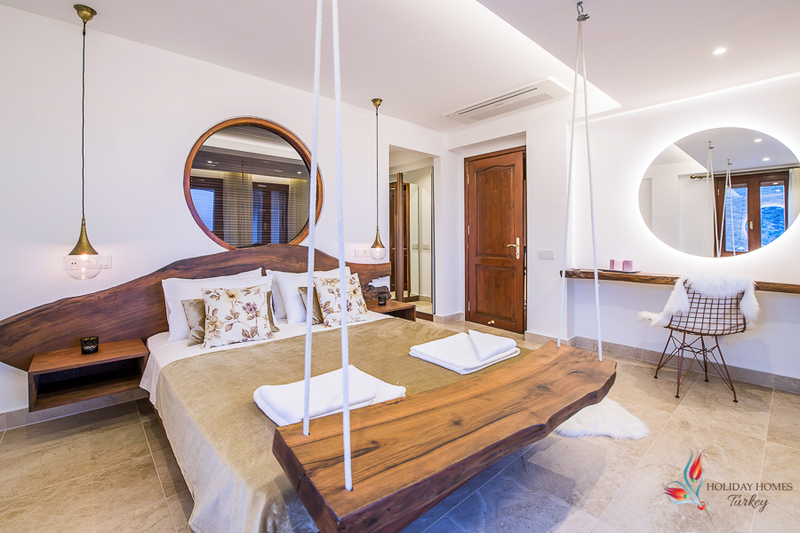 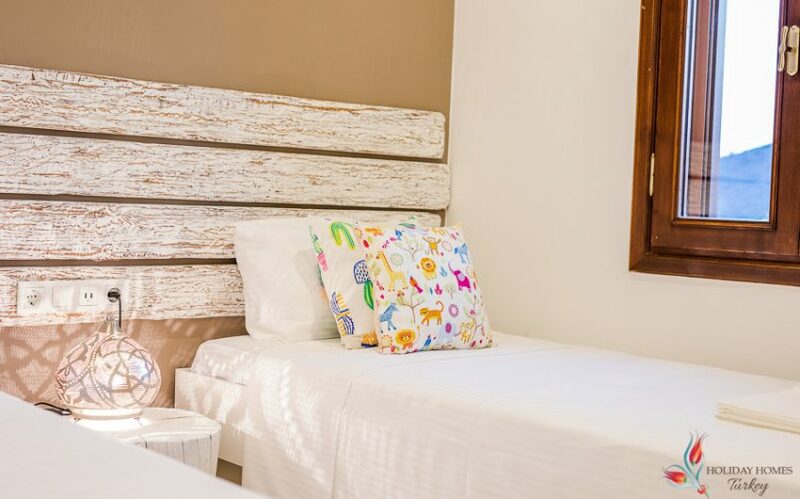 Comfy king bed with superb use of reclaimed wood again, both as a headboard and as a swing sitting playfully at the foot of the bed looking out over the balcony. 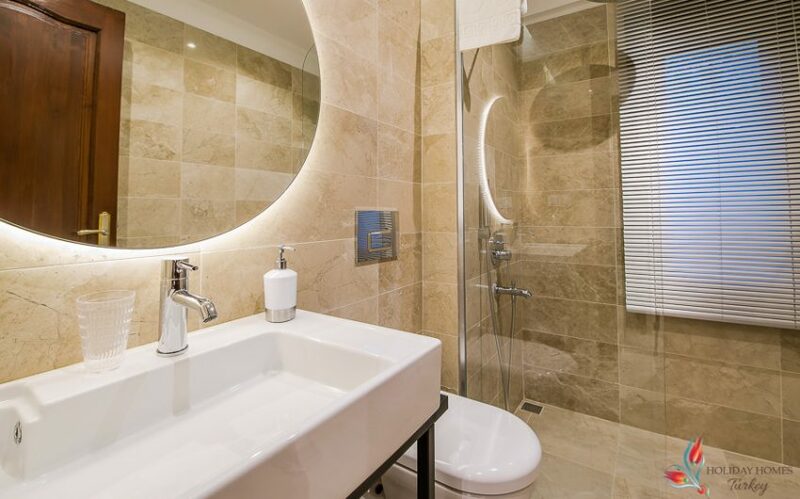 Ensuite bathroom has gorgeous fittings and his ’n’ hers rain showers. 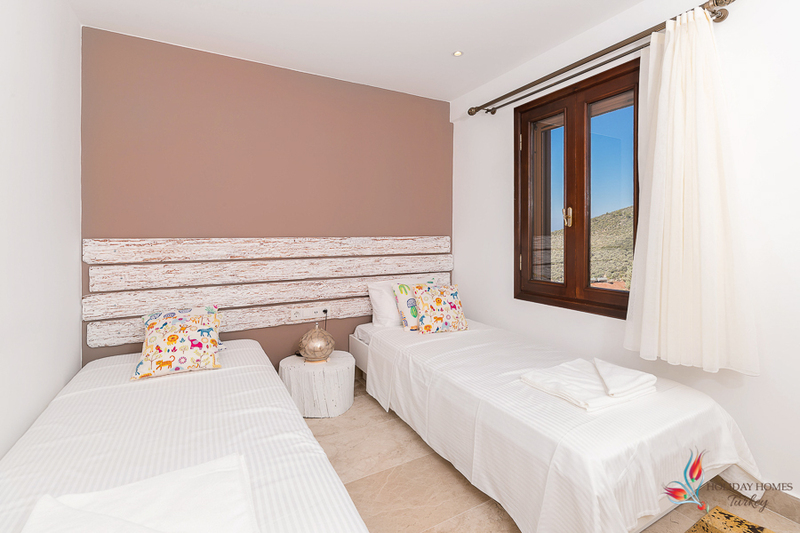 Simple, bright, light twin room with 2 singles which can be joined together. 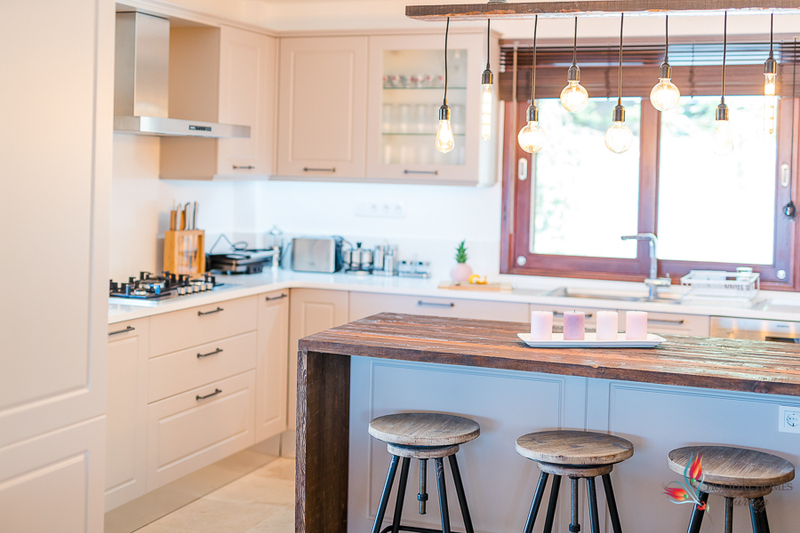 Bleached oak cabinetry, views to side of gardens and beyond. 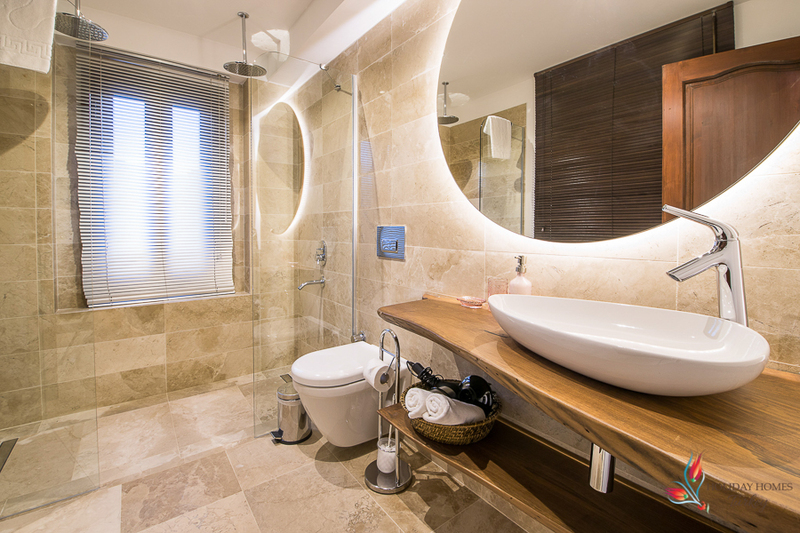 Modern, sleek ensuite. 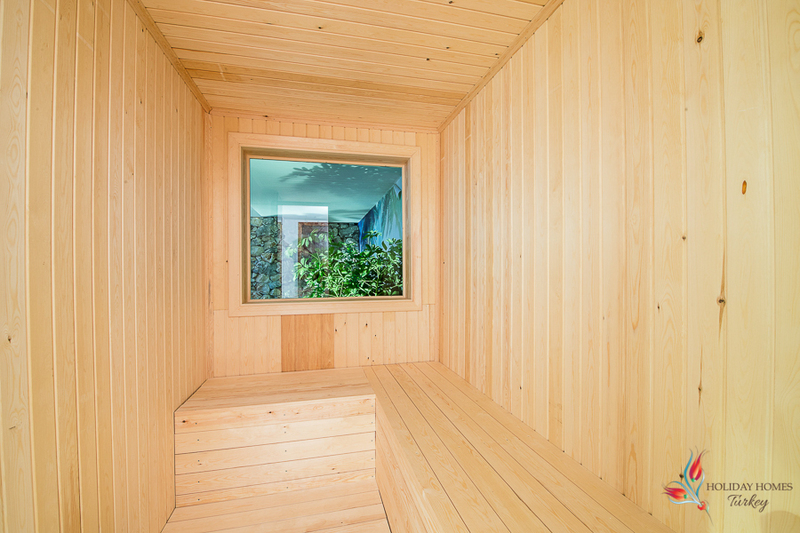 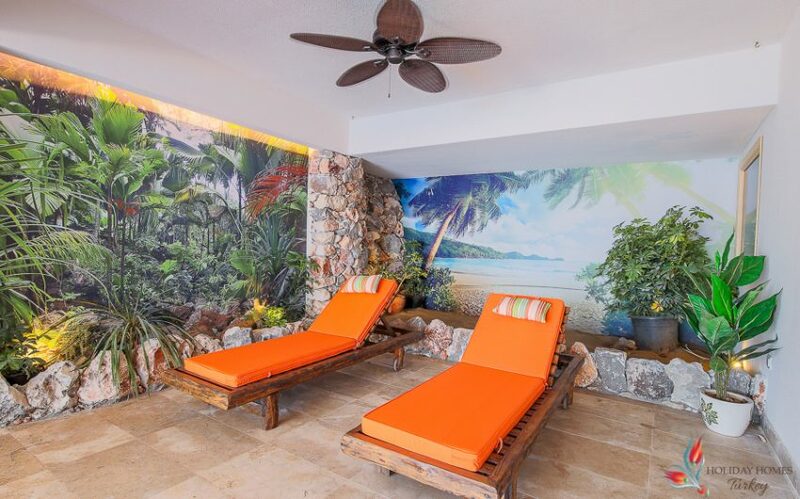 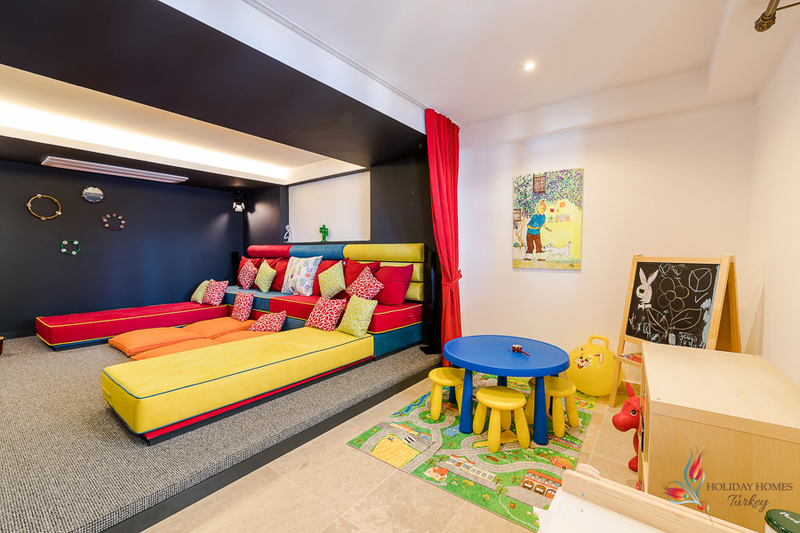 A perfect room for adults and children alike. 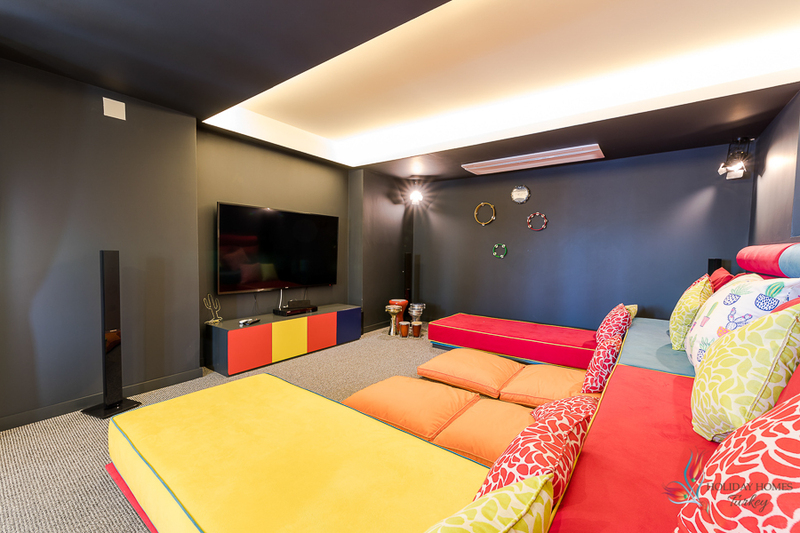 Spacious twin bedroom with colourful design accents. 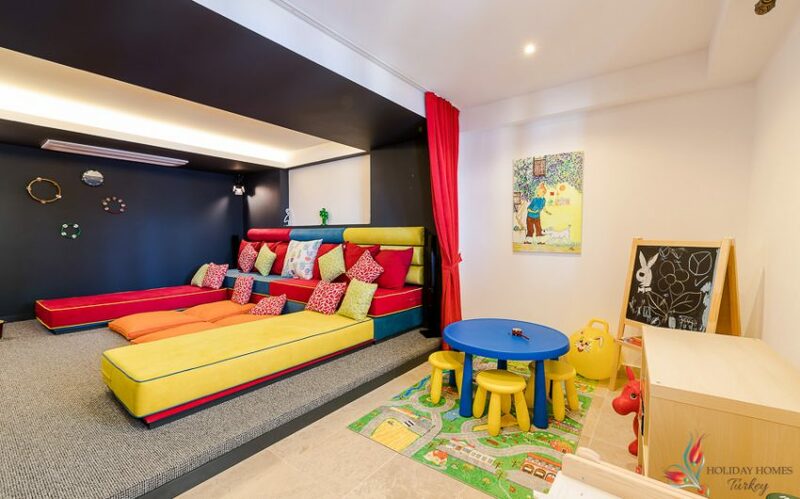 Again twins can be joined to make a king bed. 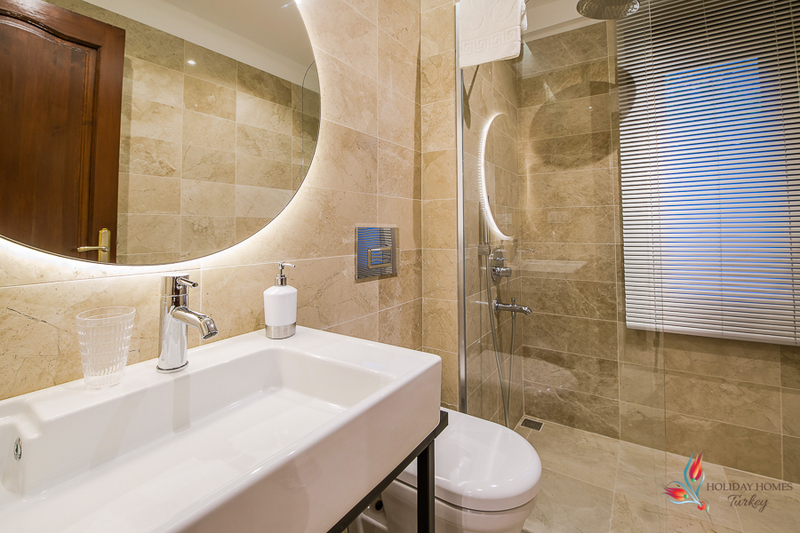 Ensuite bathroom with top quality fittings. 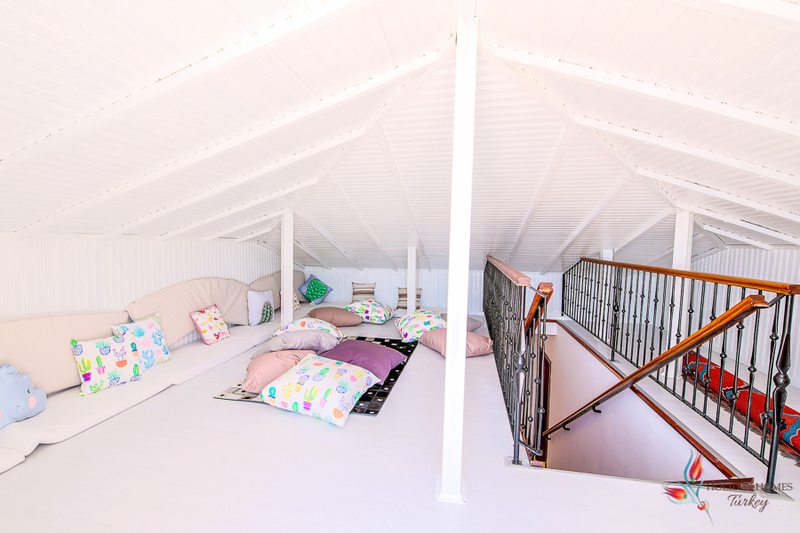 One of many places to chill but great for kids to play their games, big comfy cushions and bean bags, air conditioning, plenty of space, kitchenette and doors leading to large roof top terrace, great place for Mum & Dad to chill whilst young ones do their own thing in loft space. 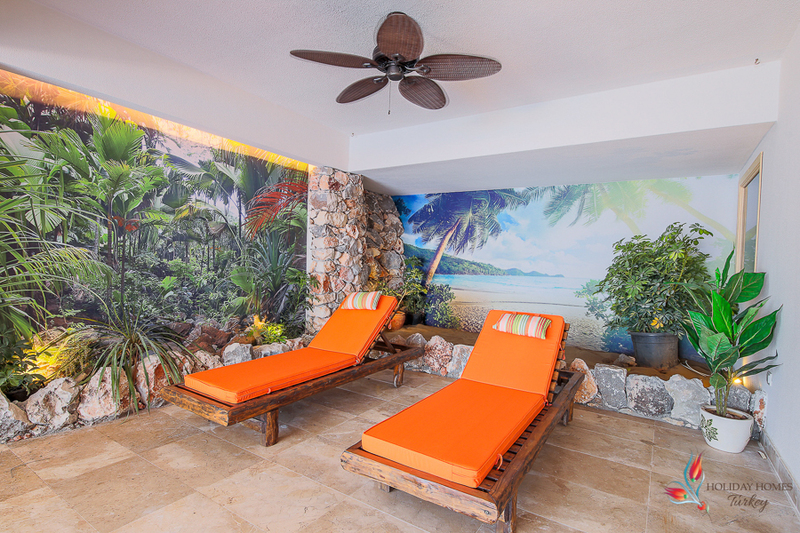 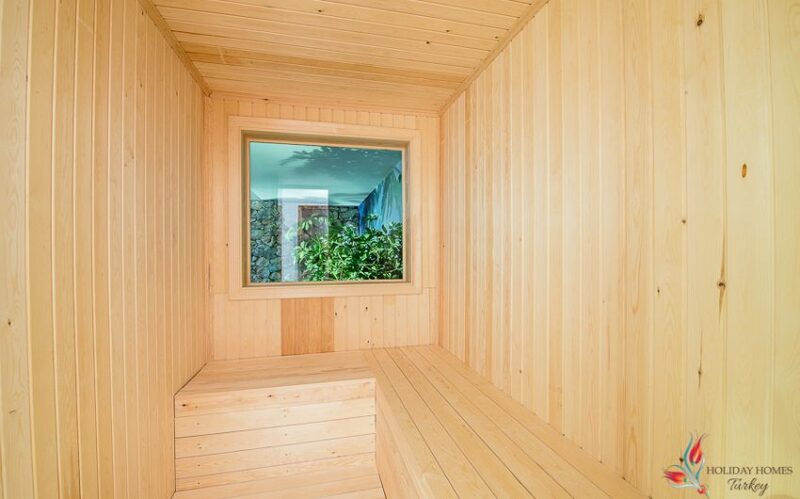 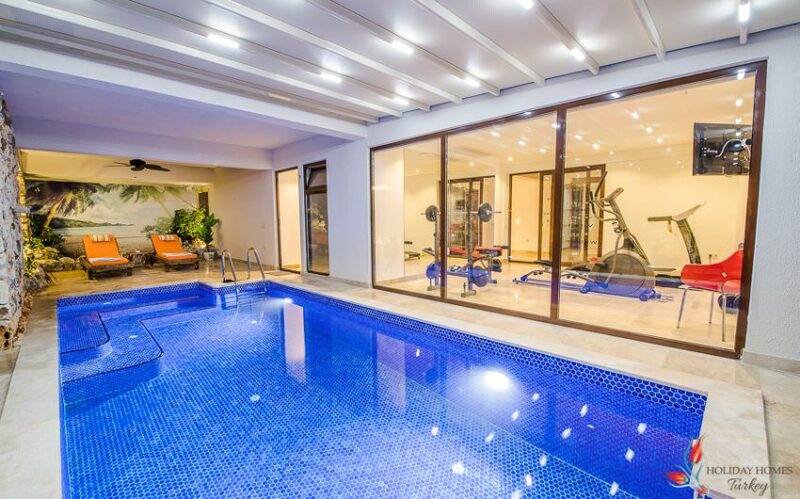 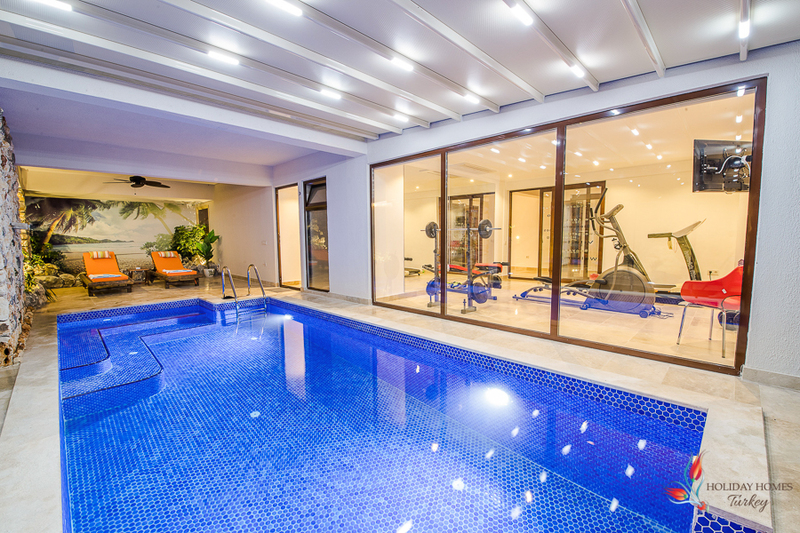 Indoor Salt Water pool (heated) with retractable remote controlled ceiling above – perfect for summer or winter. 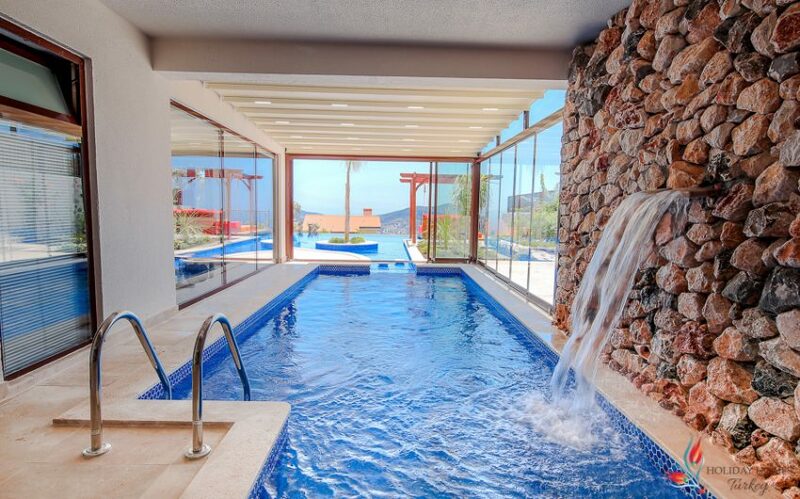 Large private infinity pool with water slide and cave. 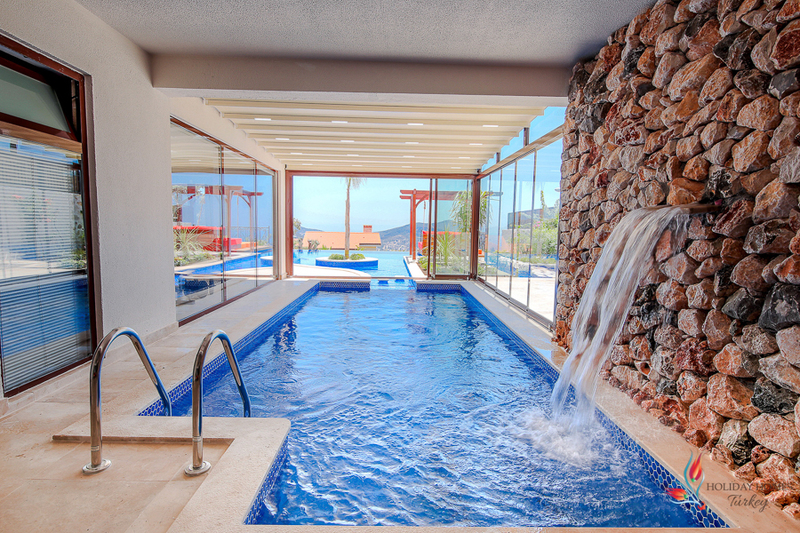 All the different areas to do just what you feel like doing in. 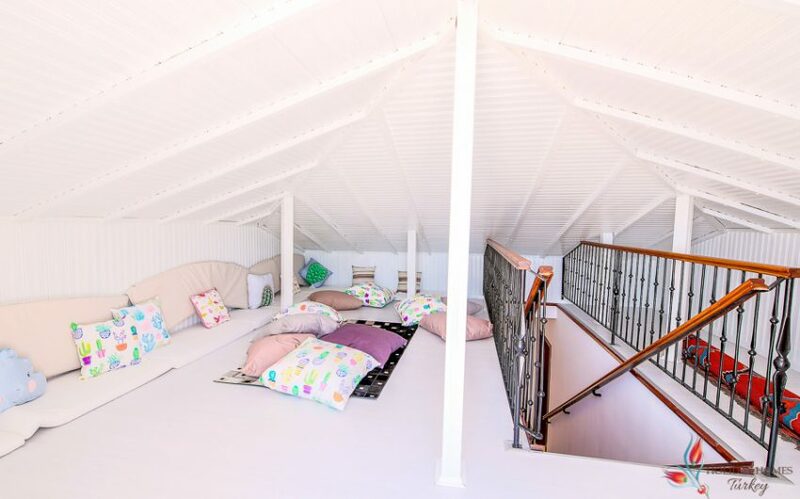 So many places to relax and spend time with friends and family but also some areas of complete quiet and tranquillity to have some quality me time! 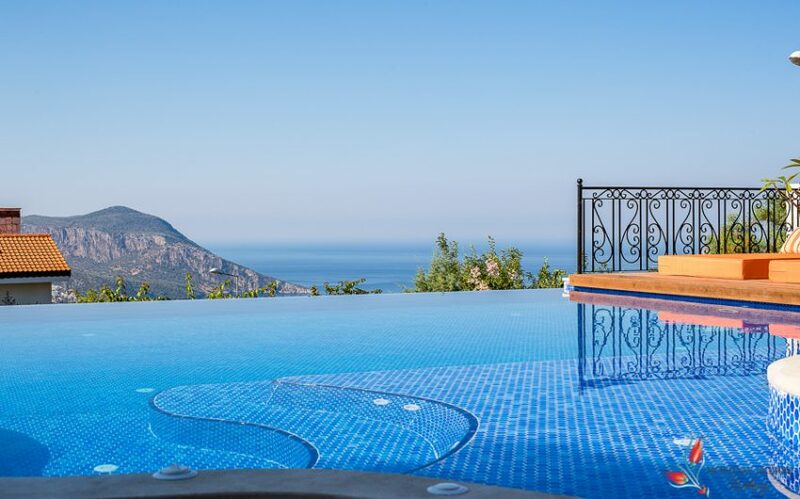 Words cannot begin to fully convey how magical this villa actually is, but hopefully the photographs will go some way to sharing it’s attractions with you – what we do know, is that if you book it, you will not be disappointed. 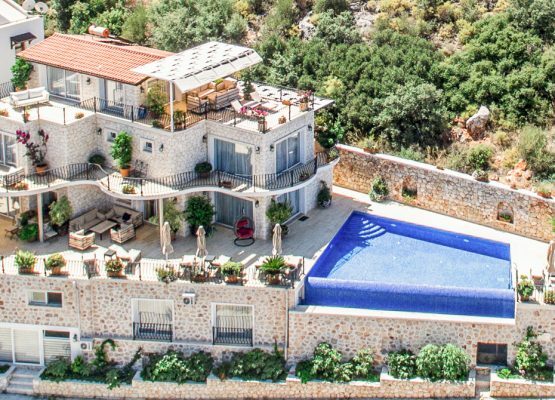 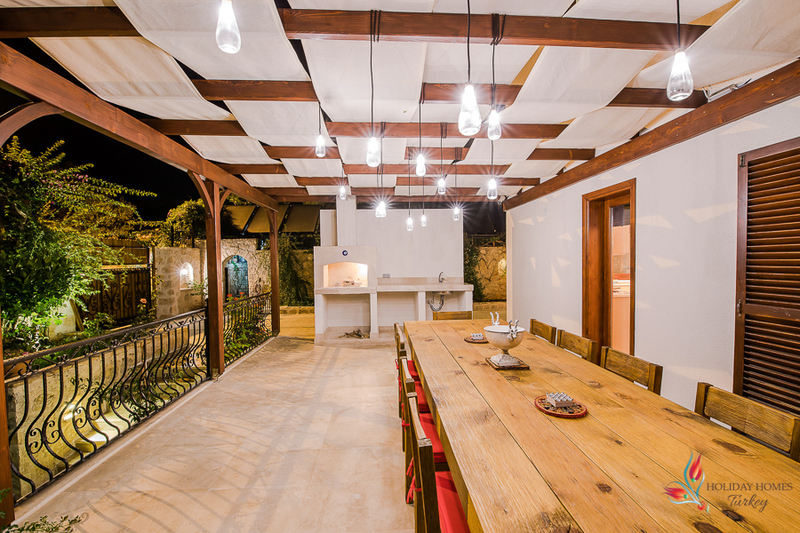 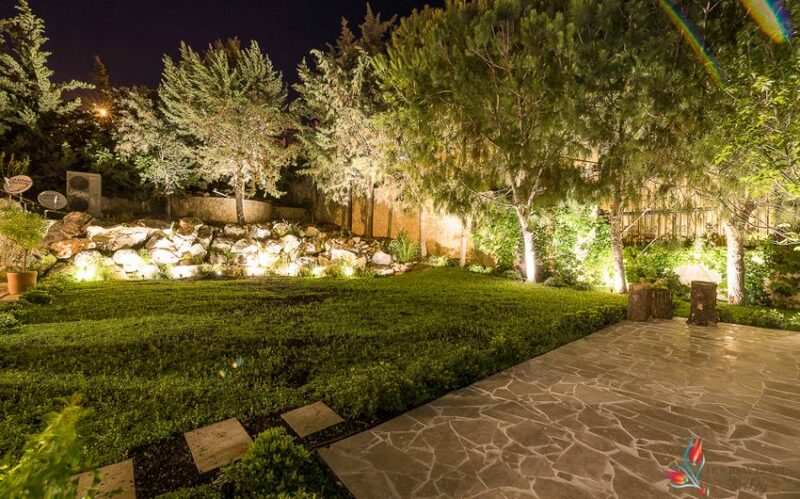 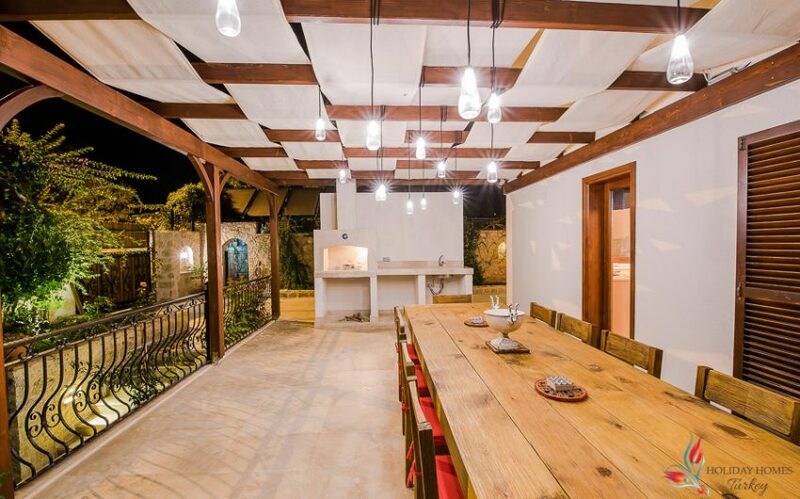 Villa Mosaic is a stunning and unusual 4 bedroomed tale of two halves, the modern and the Roman. 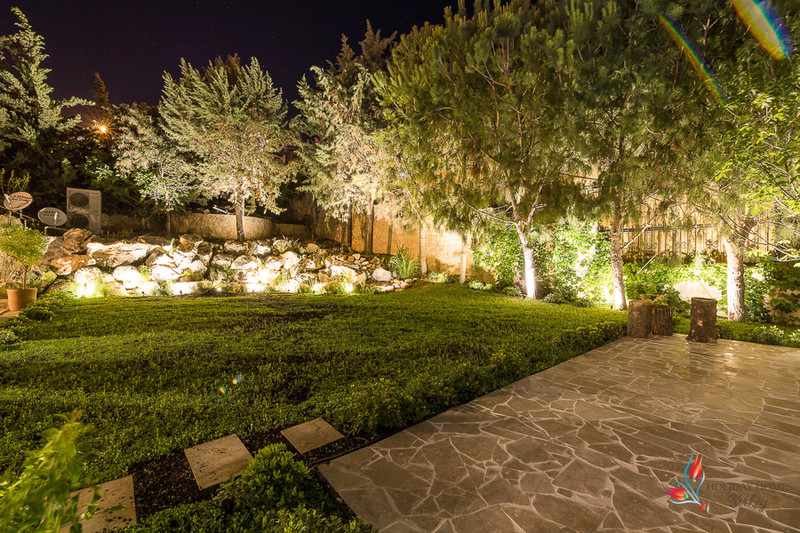 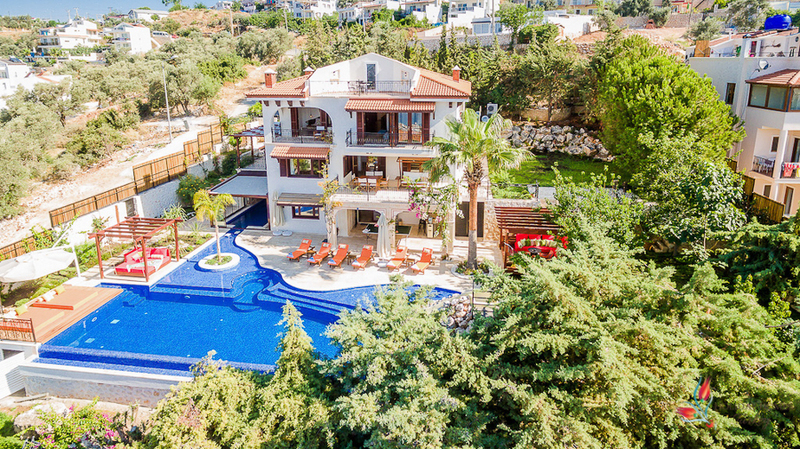 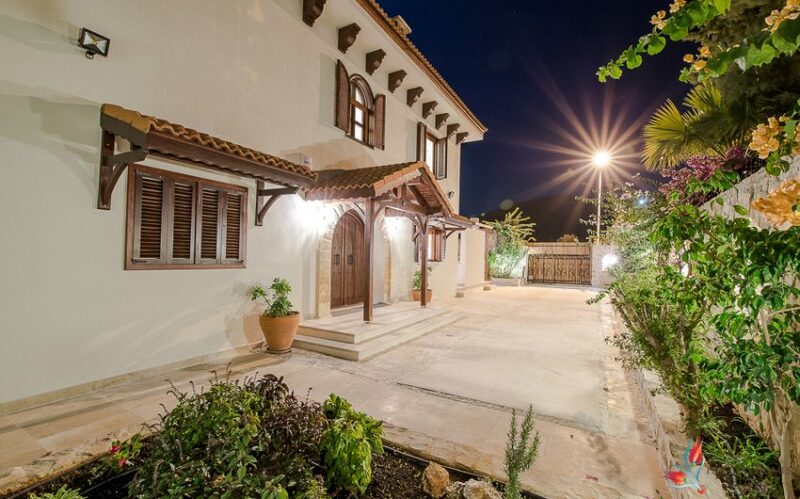 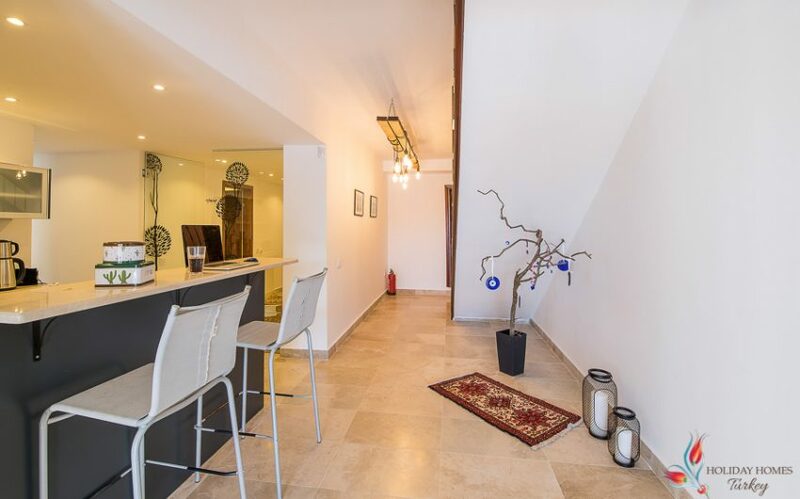 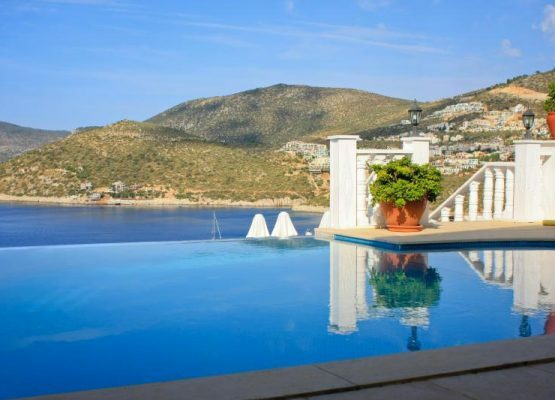 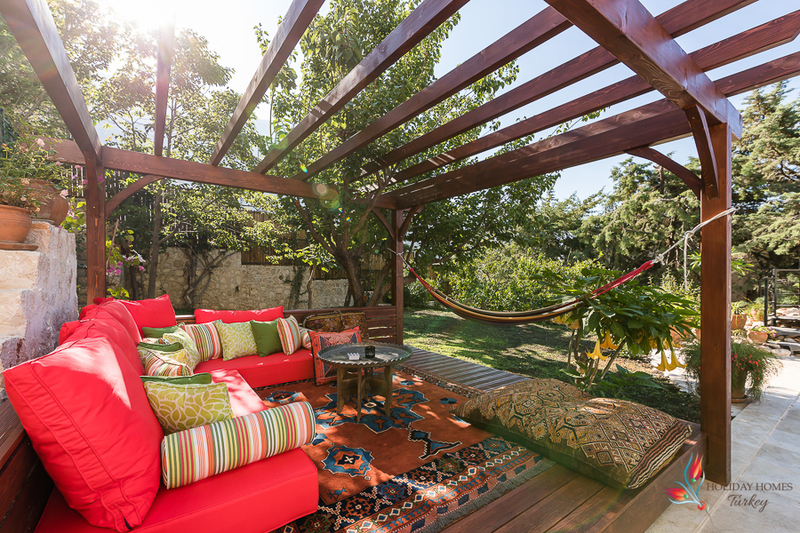 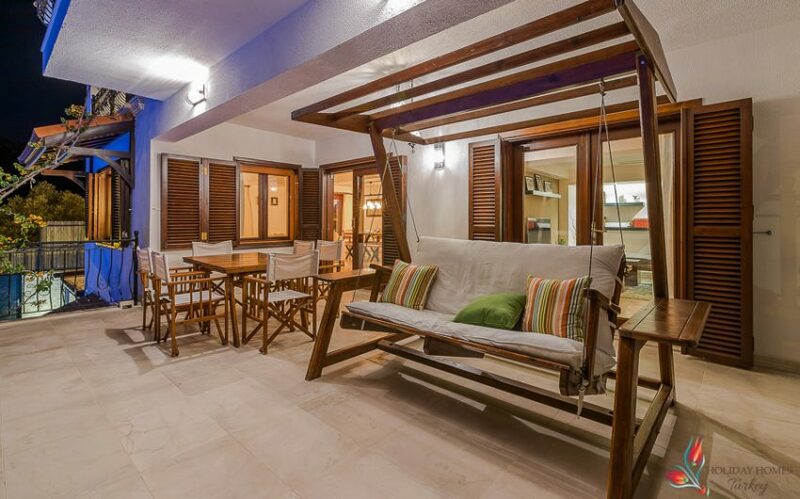 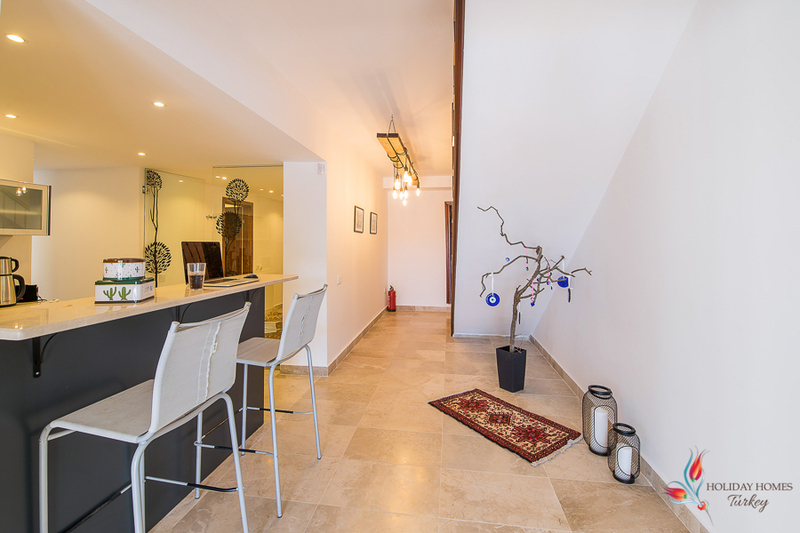 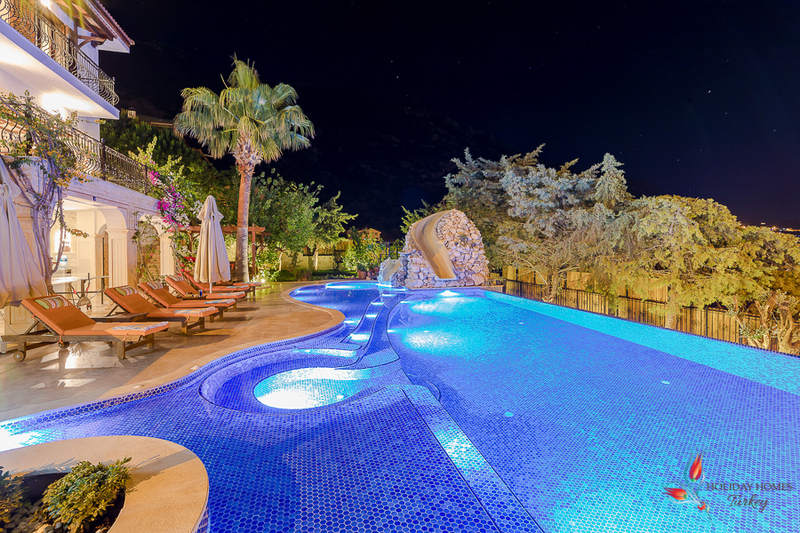 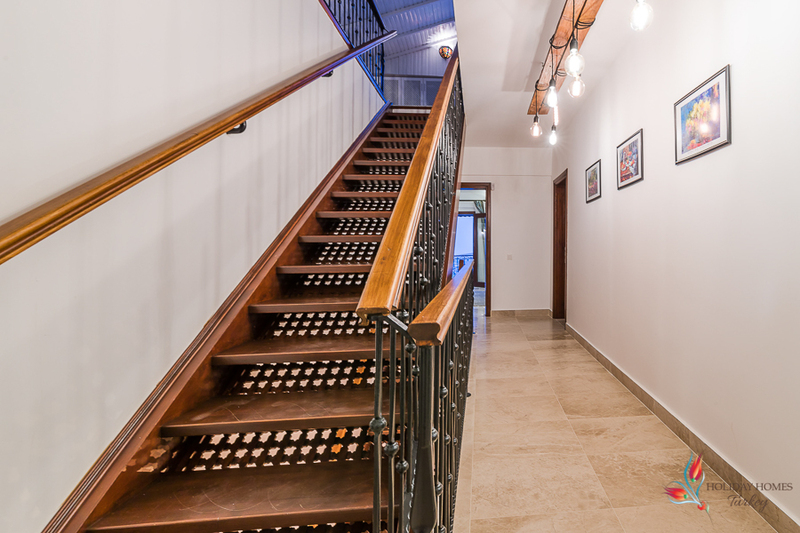 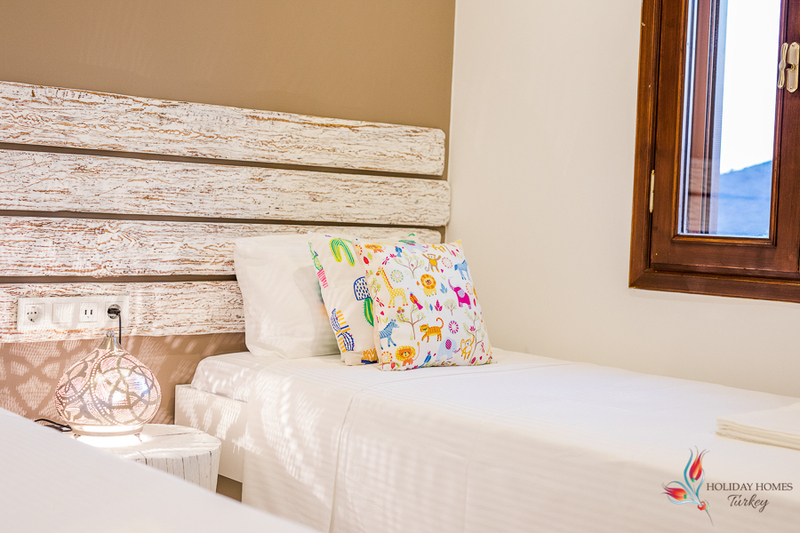 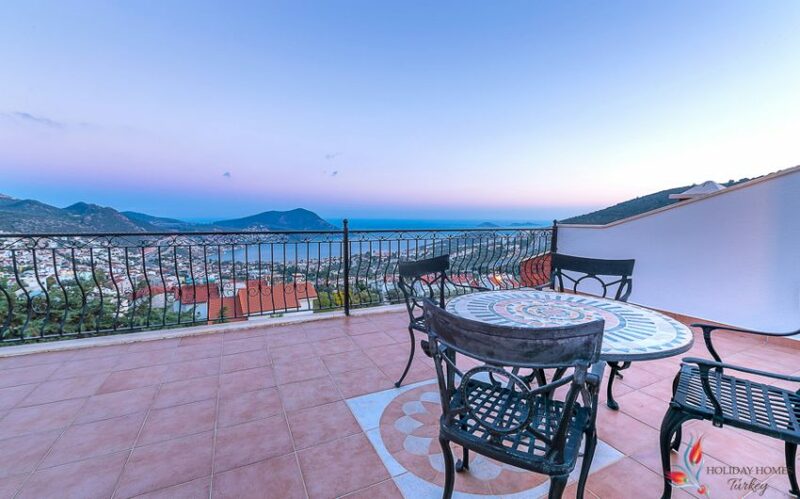 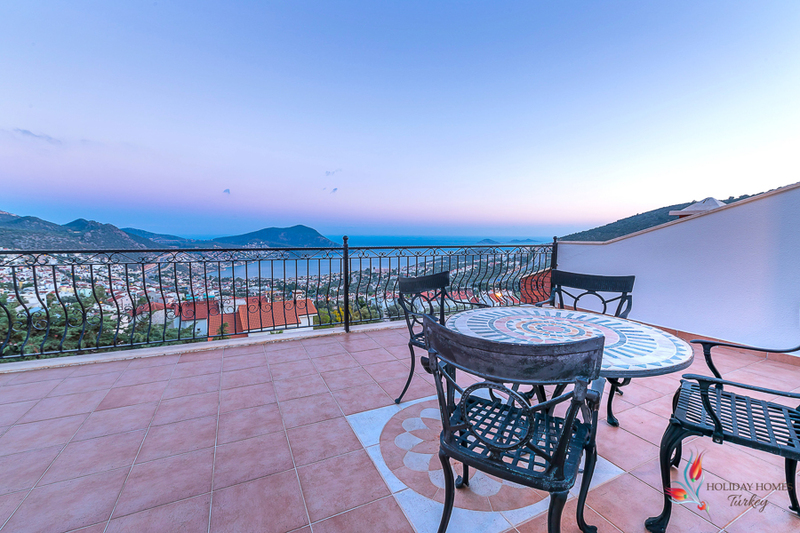 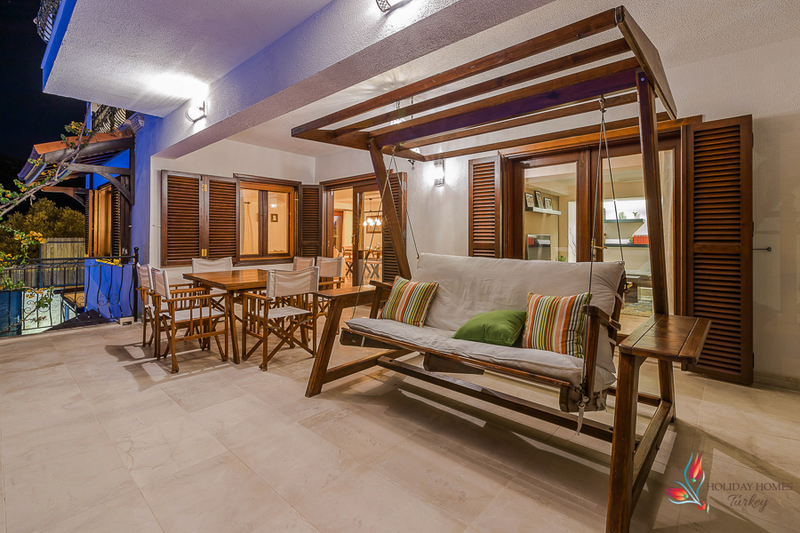 It is situated within a 10 minute walk of the beautiful town of Kalkan and only 50 metres from the sea. 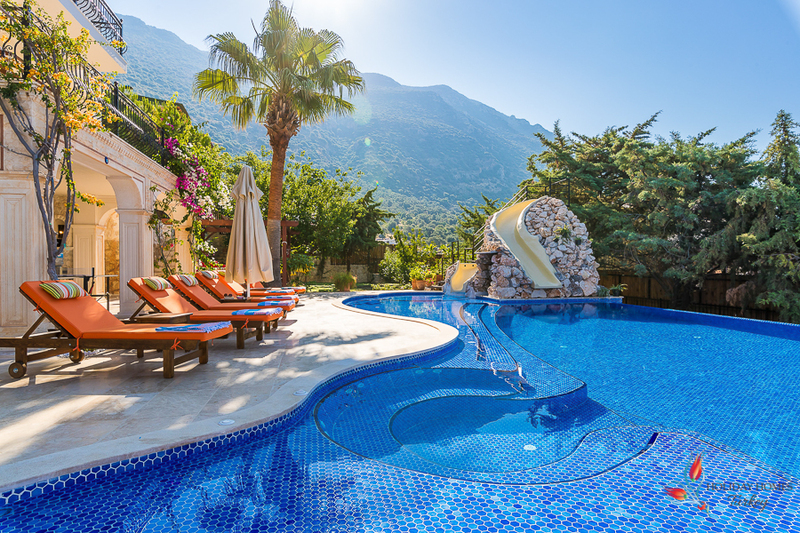 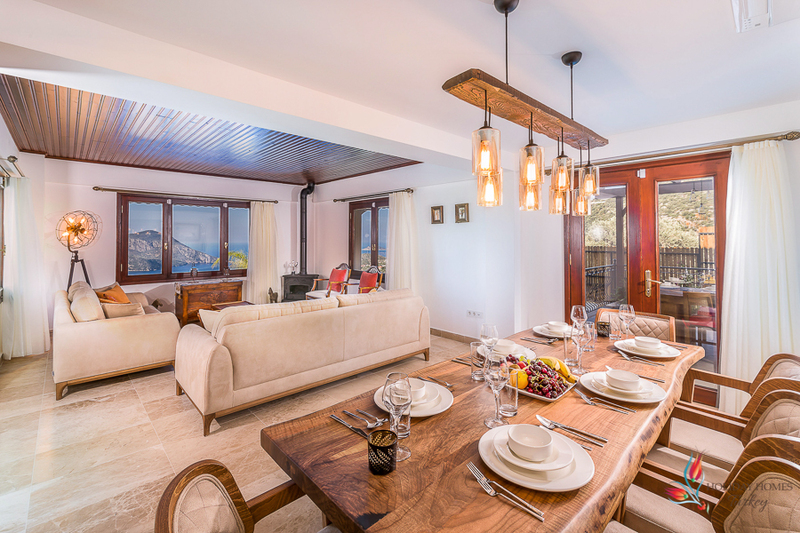 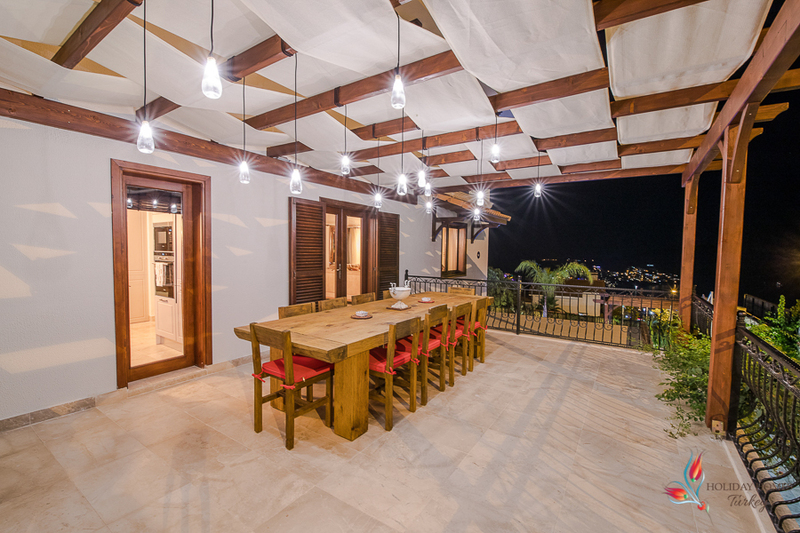 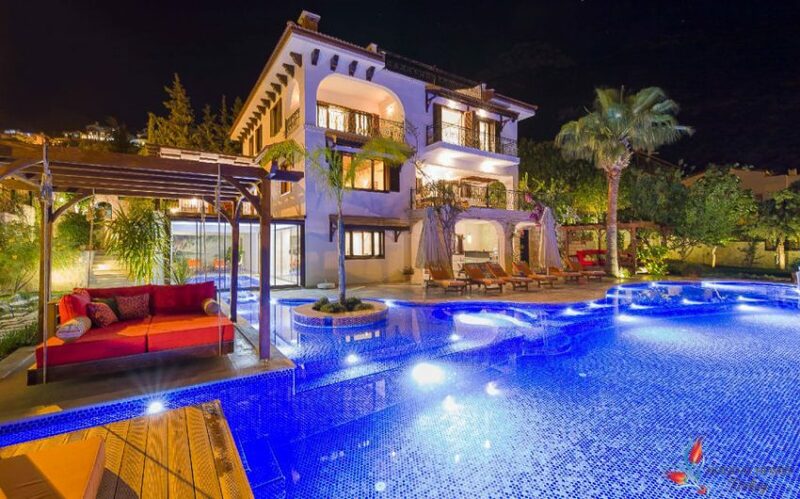 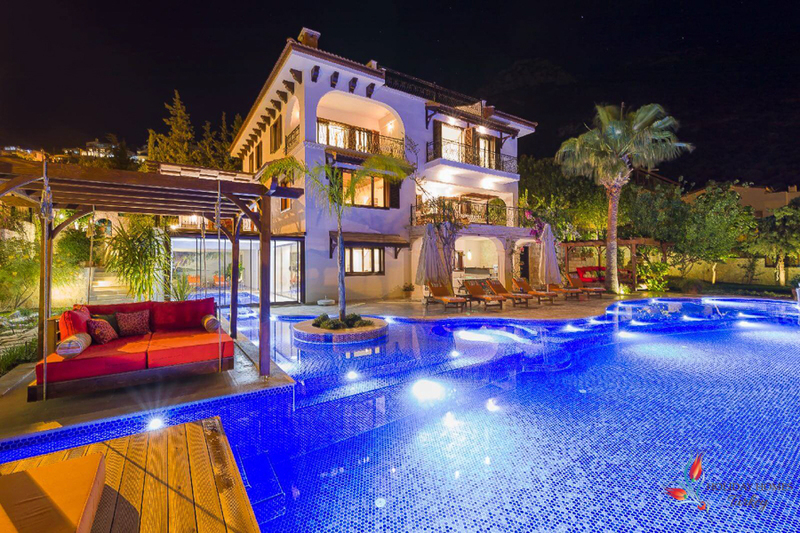 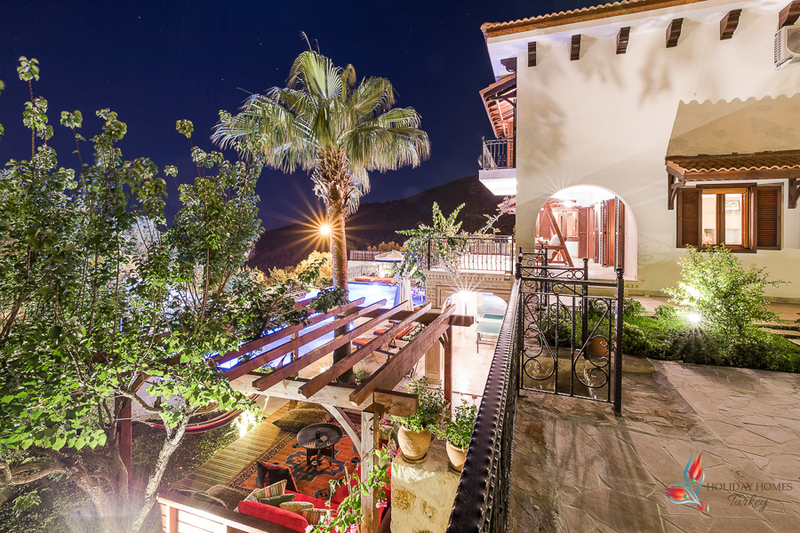 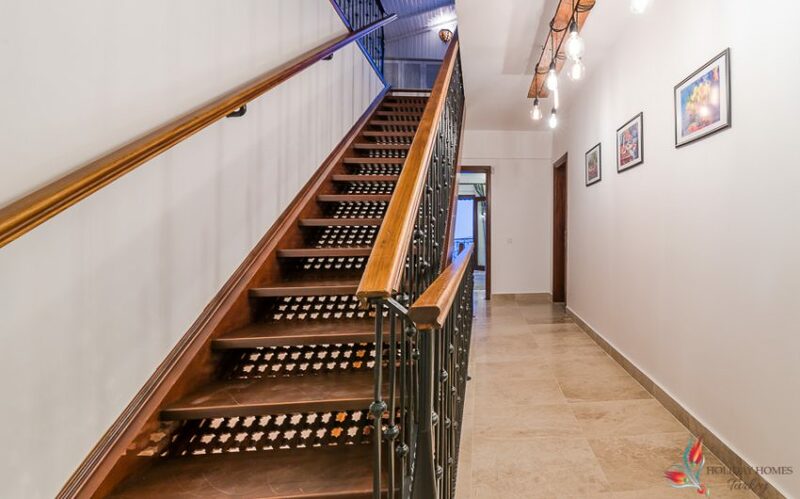 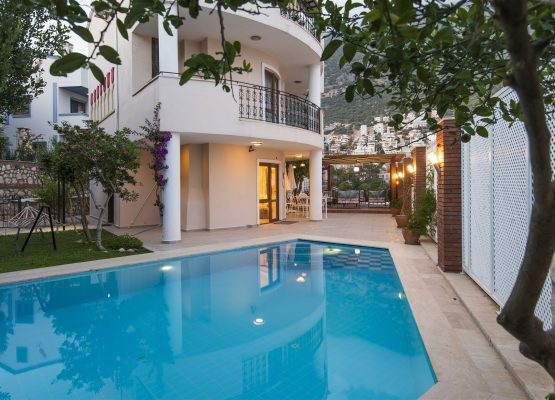 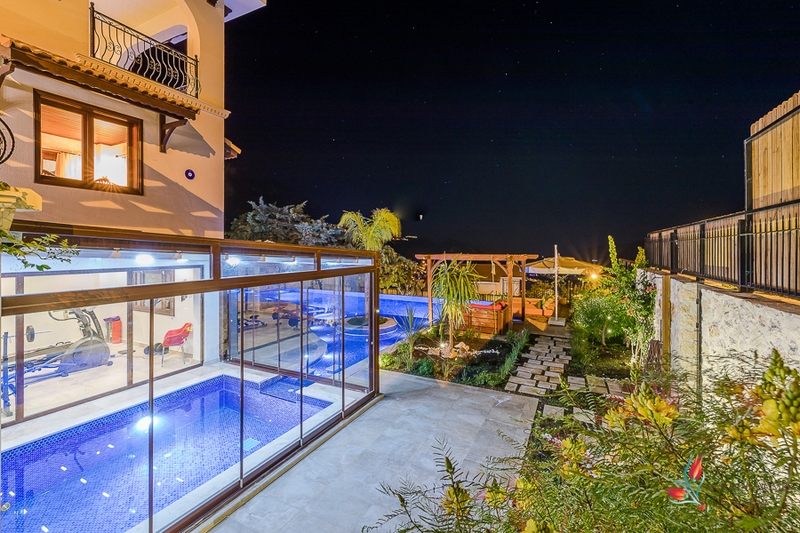 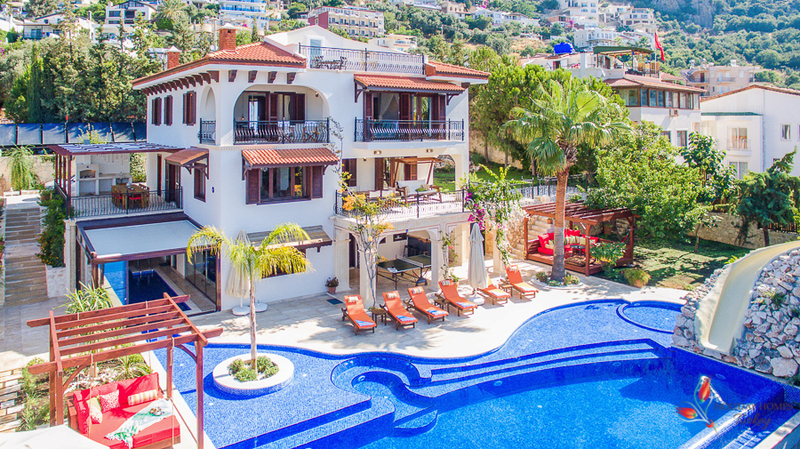 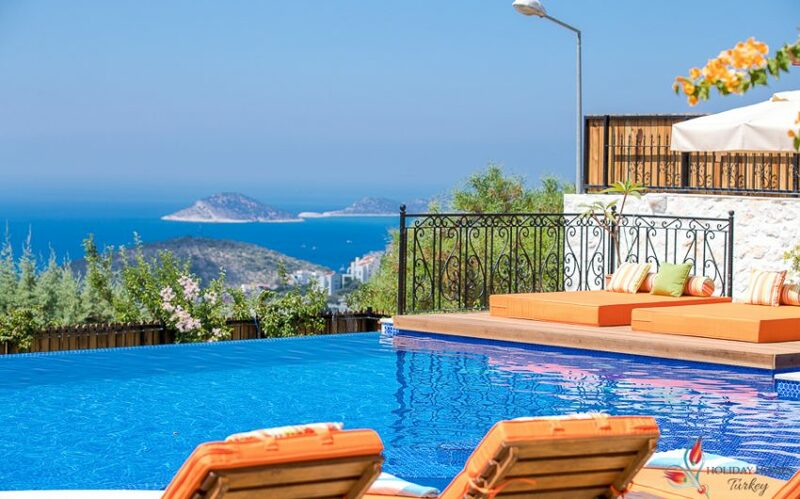 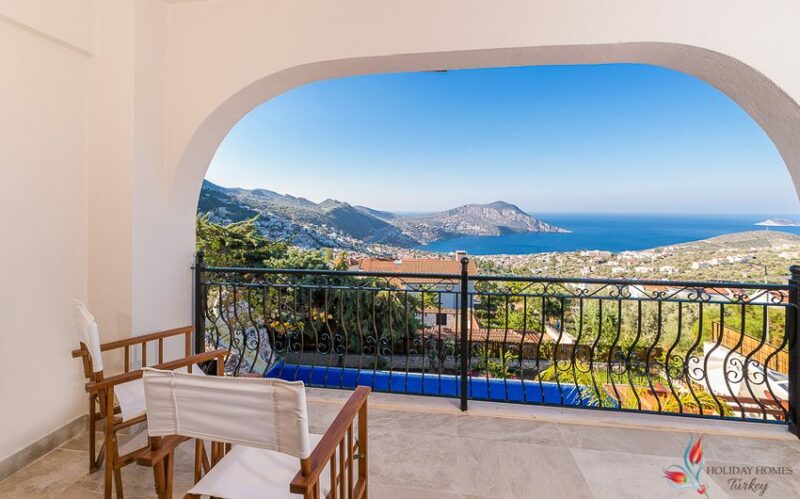 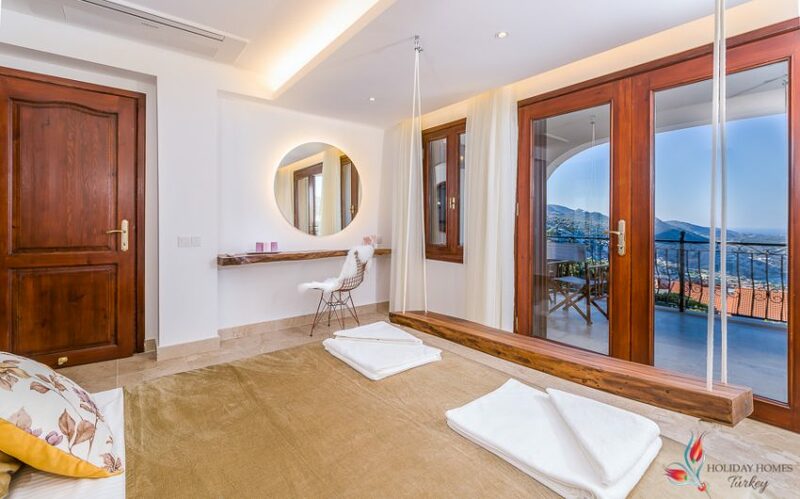 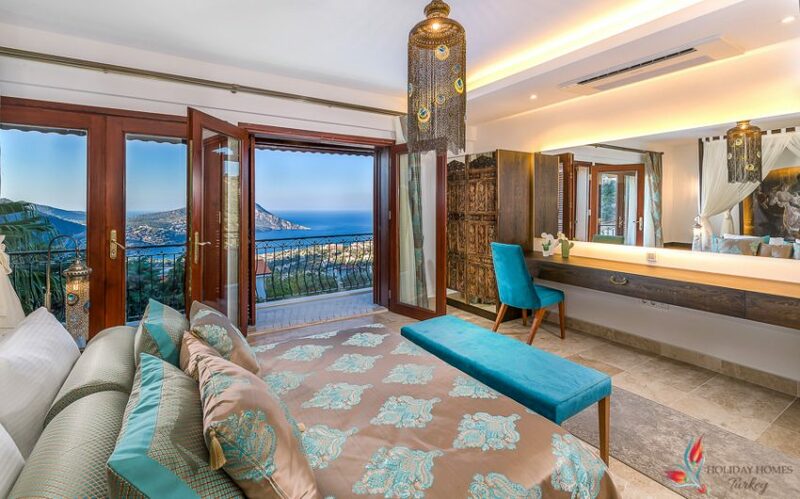 One of the newest and most striking properties in Kalkan, Premier Villa has been designed to be a luxurious get-away for grown ups, while providing plenty of space and entertainment for the whole family, from youngest to oldest.